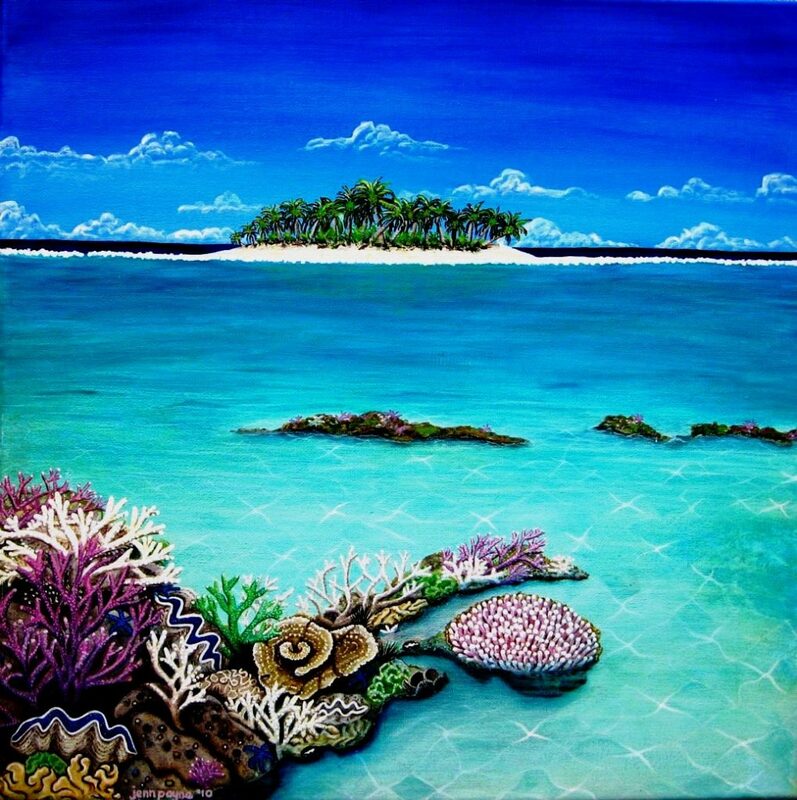 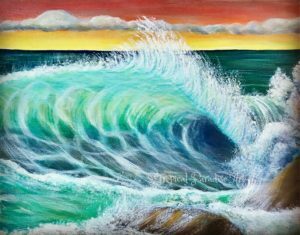 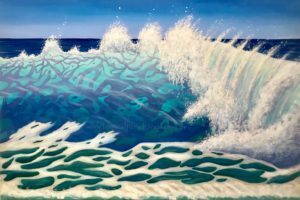 Jennifer Payne is a Mission Beach, North Queensland based Artist. Inspired by the beauty of Tropical Islands & Reefs, Jenn creates colourful, vibrant & unique artworks in the “Magical Realism” Style. 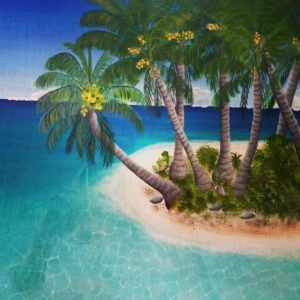 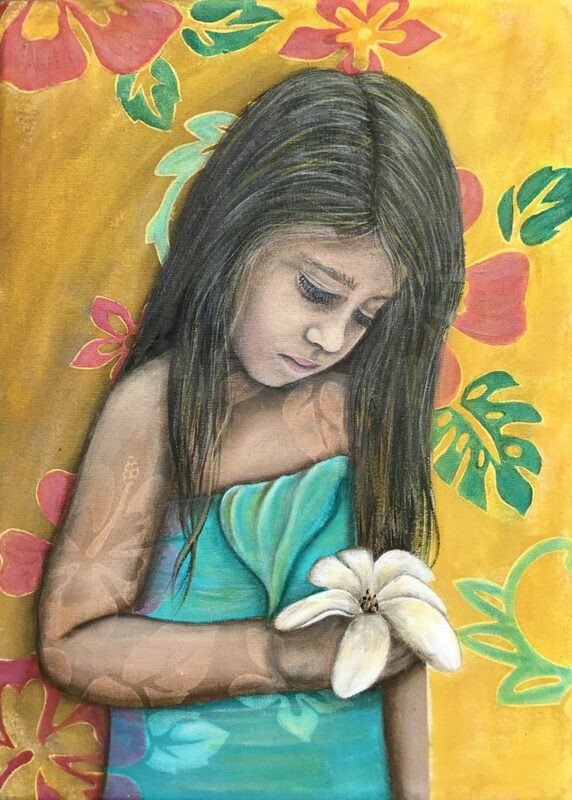 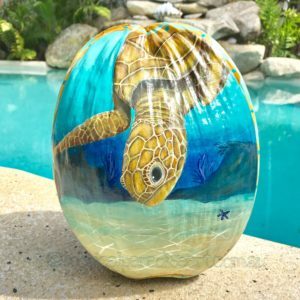 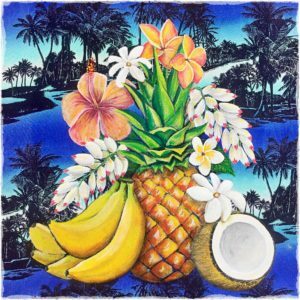 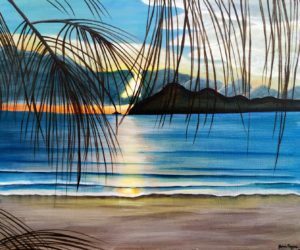 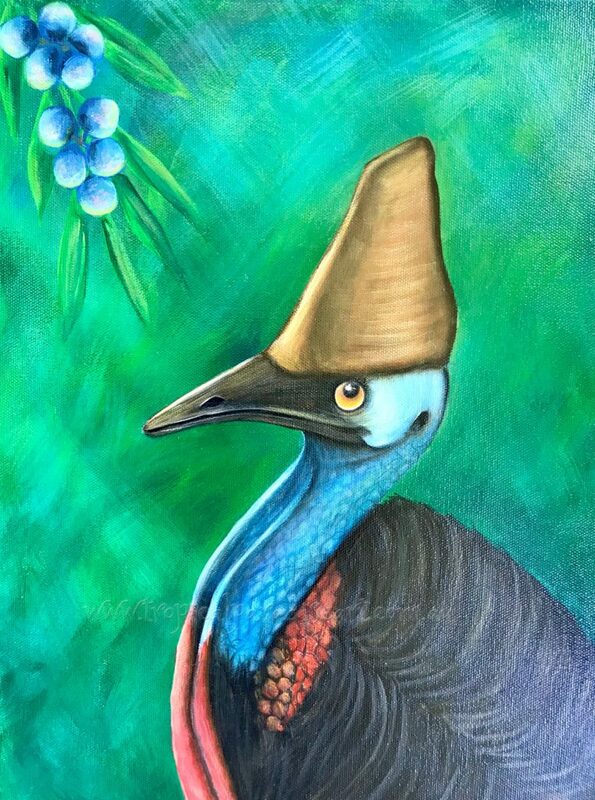 Blending her Art with nature, she not only paints on canvas but a variety of natural products including coconuts, driftwood, cotton fabric & shells. 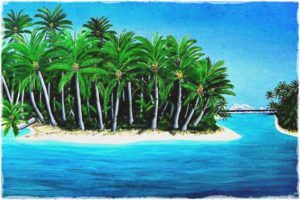 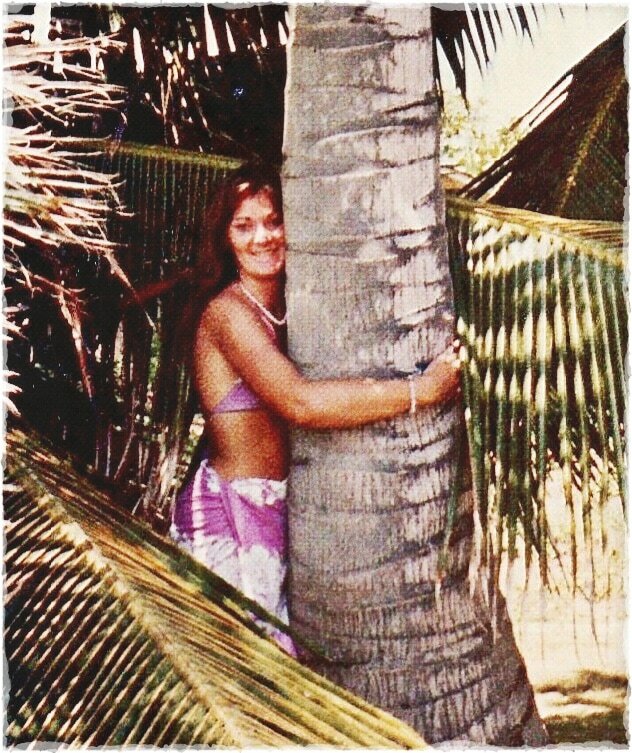 Born in Melbourne, she fell in love with Coconut Palms & the Tropics as a teenager and travelled widely to “where the coconuts grow” before settling into a job on Dunk Island in North Queensland in the early 80’s. 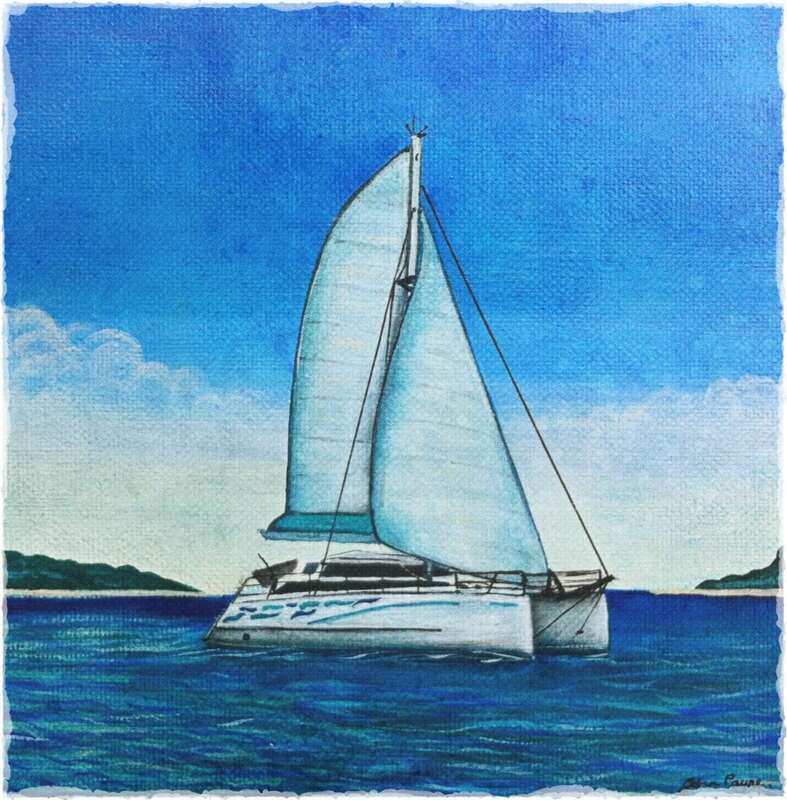 While working on beautiful Dunk Island Jenn discovered the world of boats & sailing. 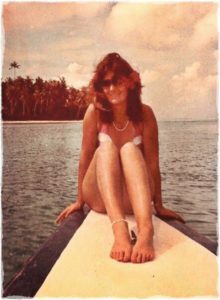 She brought her own tinny & then a small trailer sailer & sailed around the Family Islands on her days off. 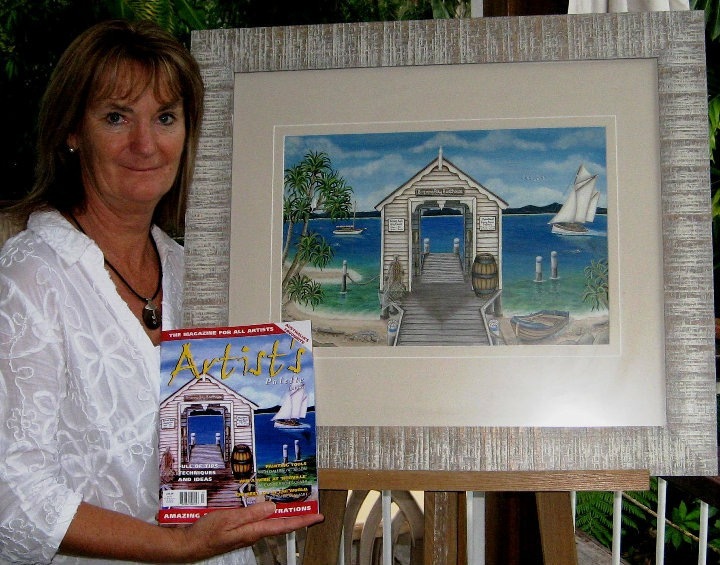 Sailing to Bedarra Island she met the legendary Noel Wood who was a world famous artist & had settled on Bedarra in the 1940’s to build his own artistic world. 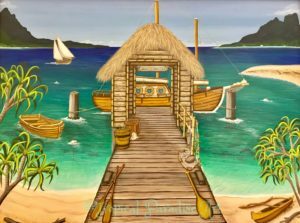 Noel along with Bruce Arthur who had established an Artist colony on Dunk Island for his Tapestry Weaving also influenced Jenn in her yet to be Artistic career. 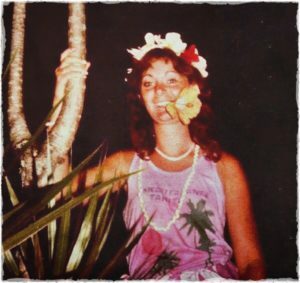 A few years after she then moved across to the mainland town of Mission Beach, just opposite Dunk Island. 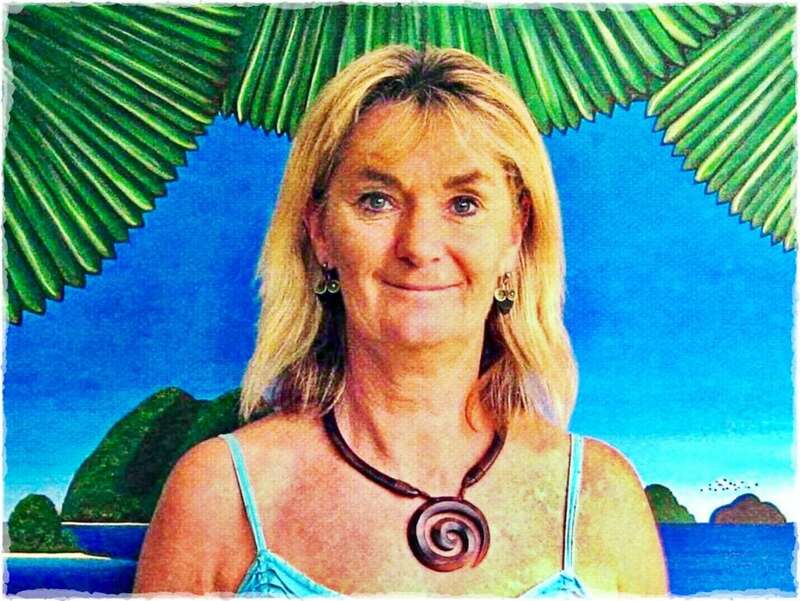 Now a resident there for over 35 years Jenn spent the majority of these years working as a Skipper on Tourist vessels, exploring the magical reefs and islands in this area. 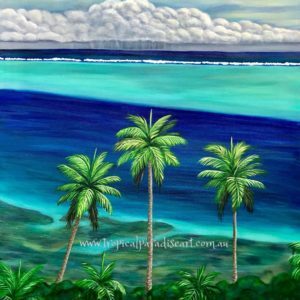 It was during these years that the scenery and colours of the Great Barrier Reef & Tropical Islands inspired her to start painting. 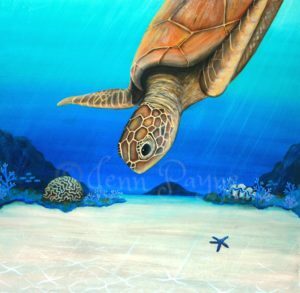 Starting out in 2003 and loving to paint in Acrylics, Jenn was originally self taught but improved her techniques with “Folk” Art classes. 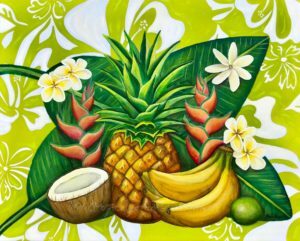 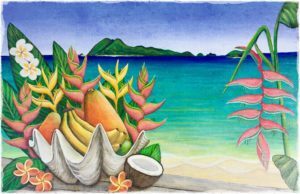 Her work has evolved over the years from Nautical and Island scenes through to her most recent Tropical fruit and flowers still life. 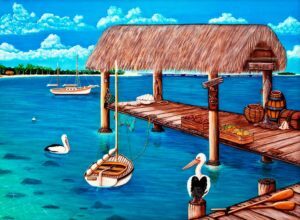 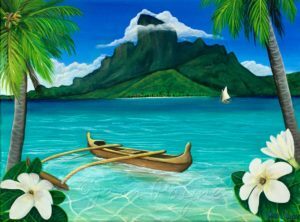 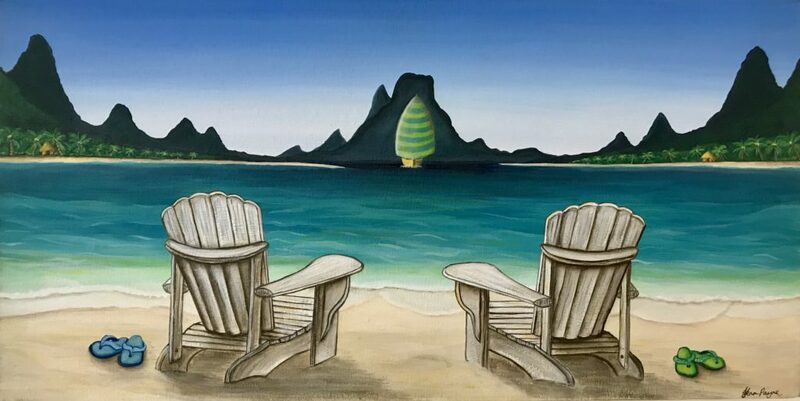 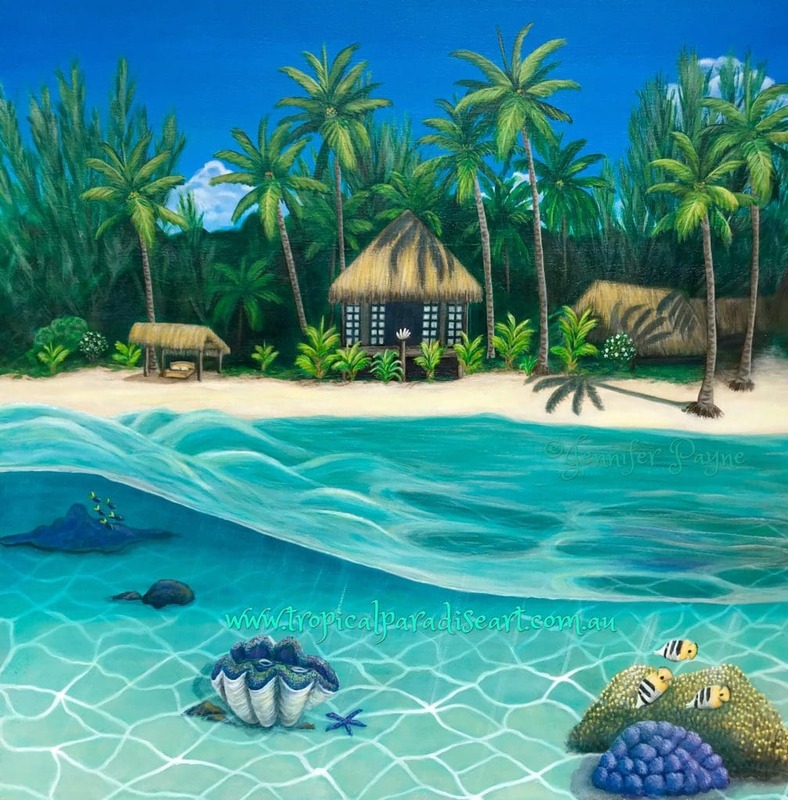 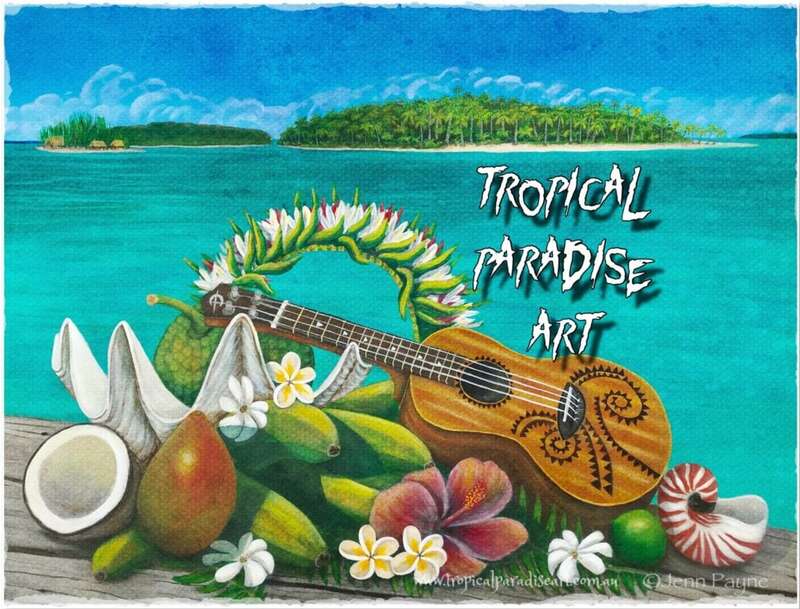 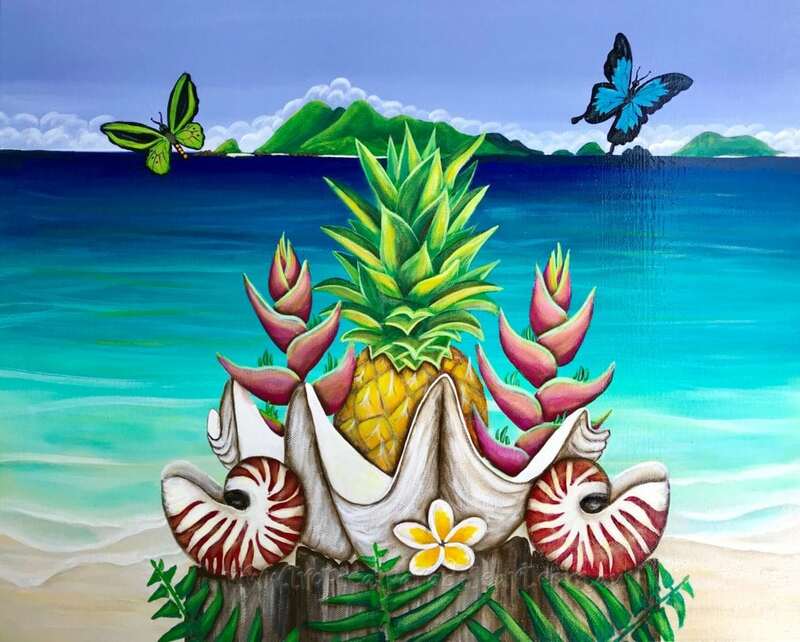 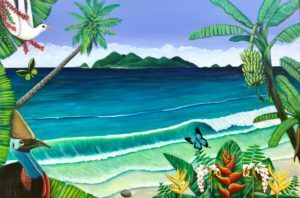 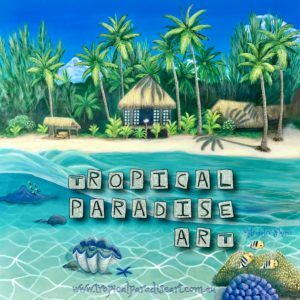 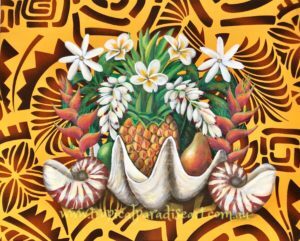 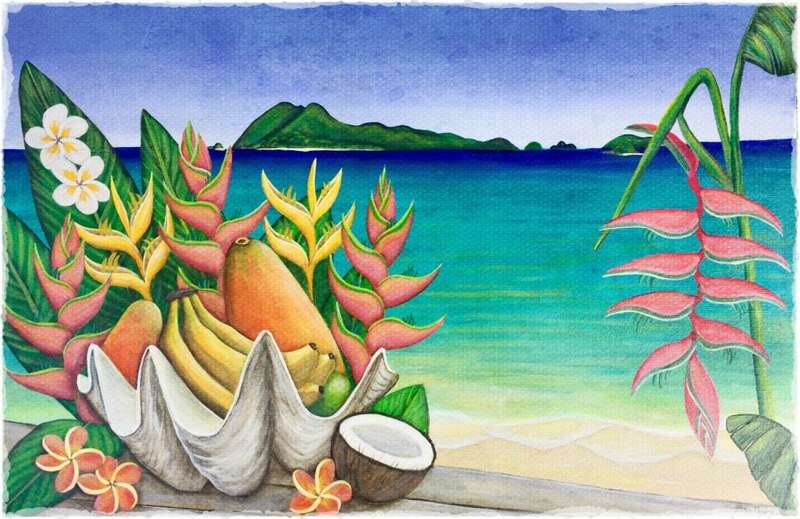 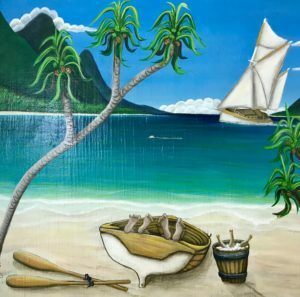 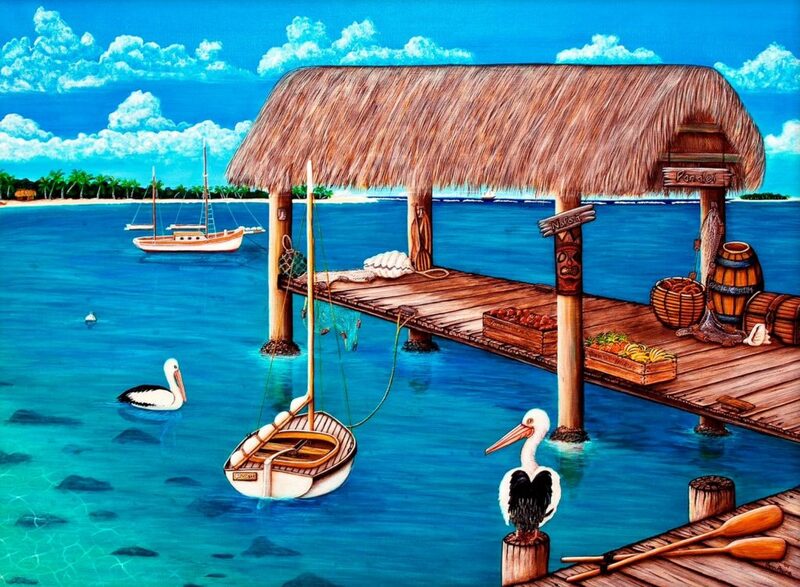 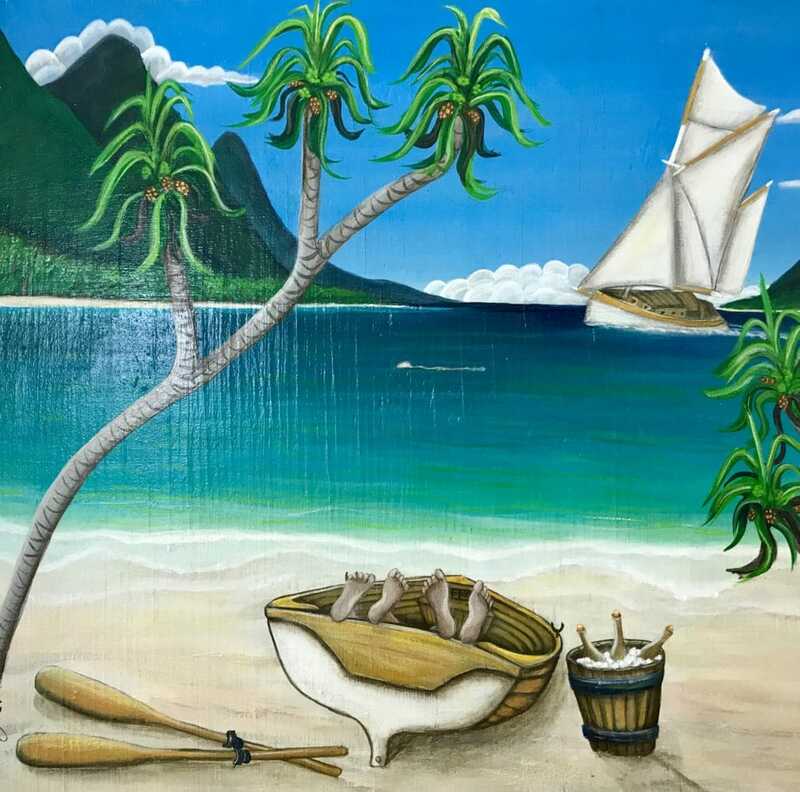 Attending a workshop on Bora Bora in Tahiti in 2016 (see video of workshop below) greatly inspired these works and she is now incorporating this new inspiration into local North Queensland scenes. 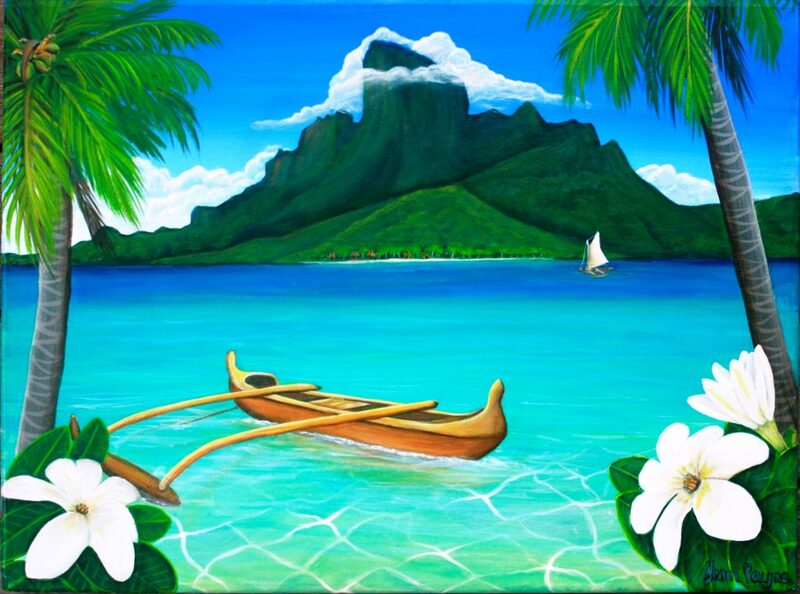 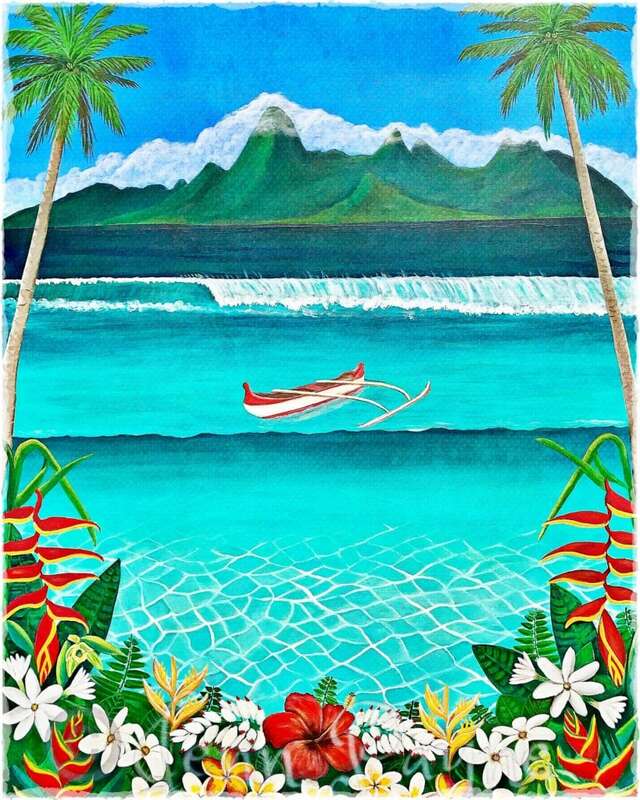 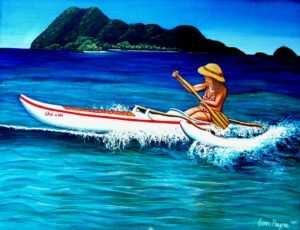 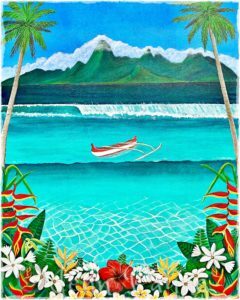 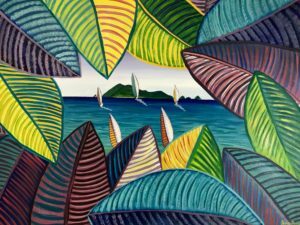 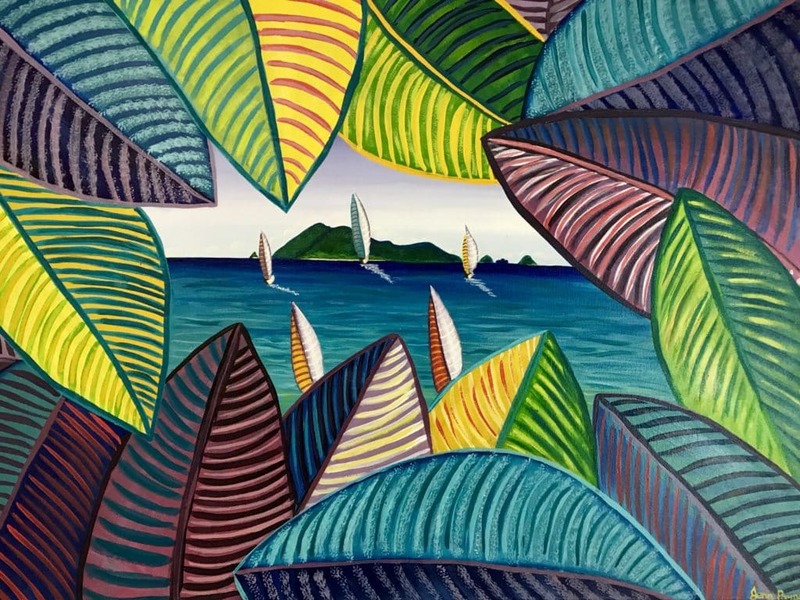 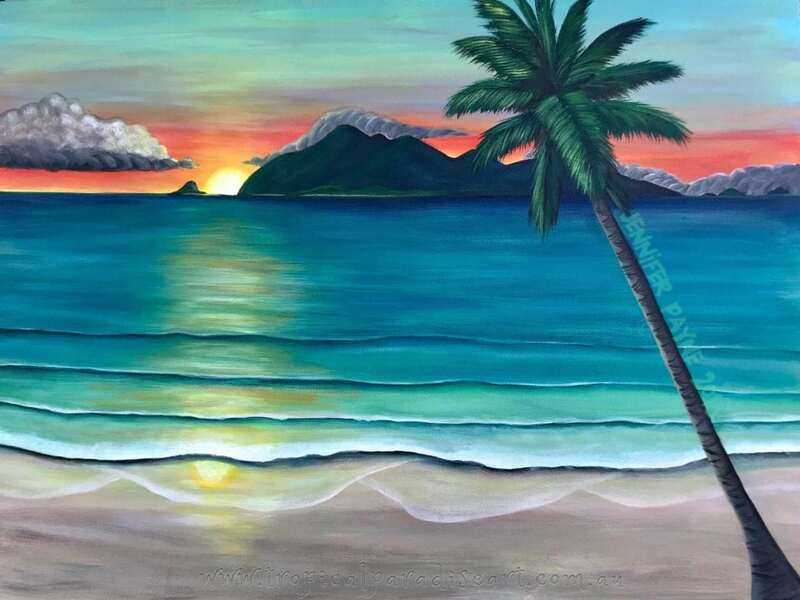 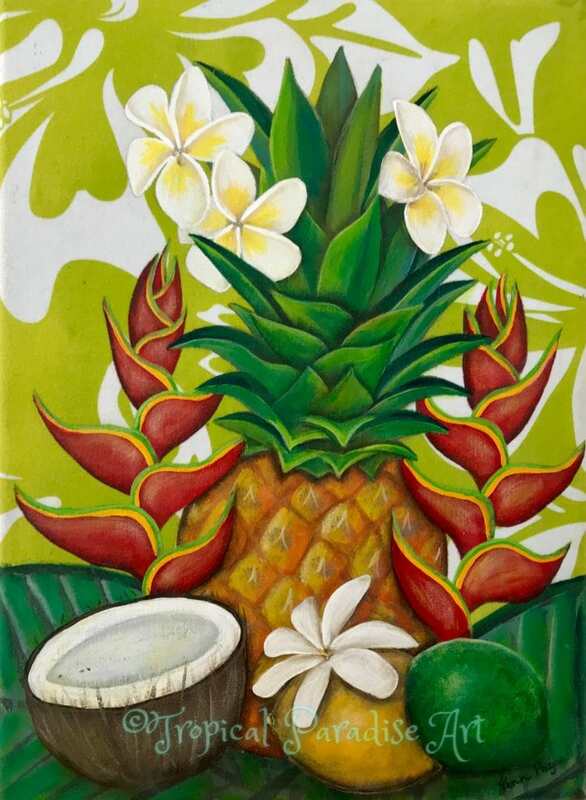 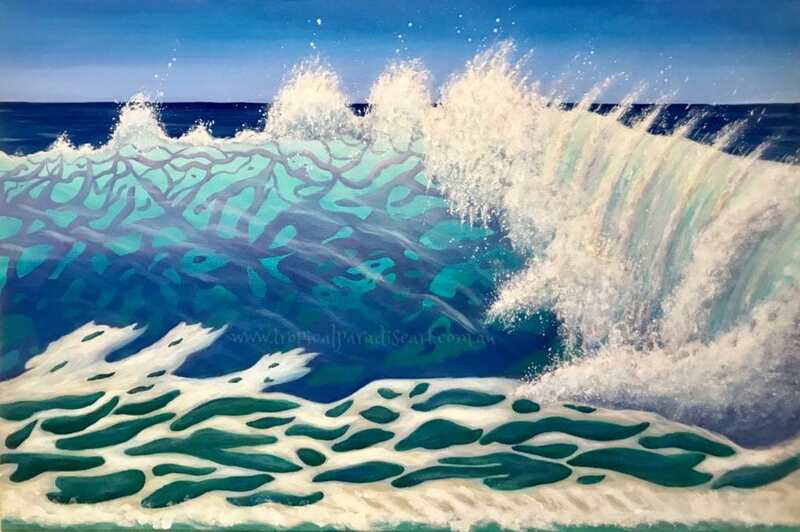 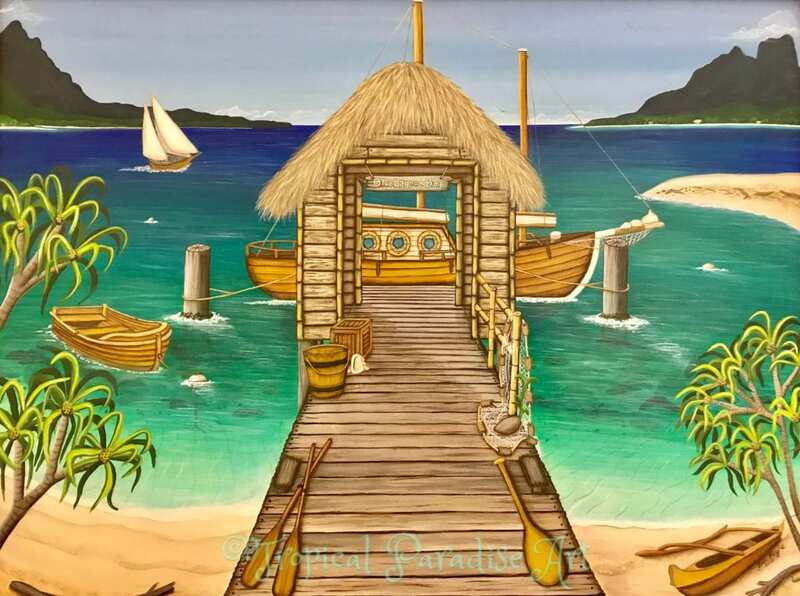 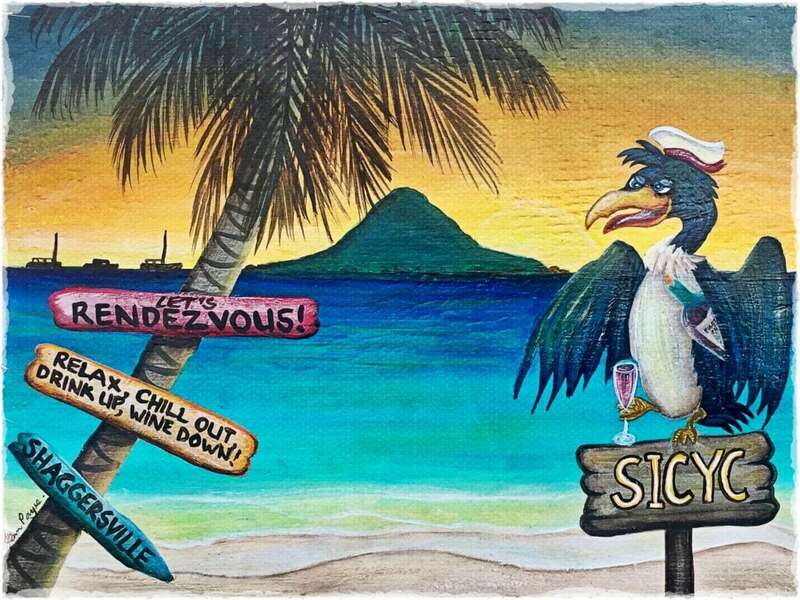 Jenn’s love for Tahiti began when she first visited as a teenager & since she began her Artistic career the islands of Tahiti have featured in her works. She was fortunate enough in 2016 not only to attend the Art workshop on Blue Heaven Island in the lagoon of Bora Bora but to return later that year to Skipper a 50 foot Catana charter yacht, with a group of SUP enthusiasts, around the islands of Raiatea, Tahaa & Bora Bora, (see video of cruising below). Her love of the vibrant colours in the Tropics (particularly the sparkling turquoise lagoon colours) is evident in her works. Jenn’s painting “Cassowarys View” won Highly Commended in the Cardwell Art Prize in 2008. 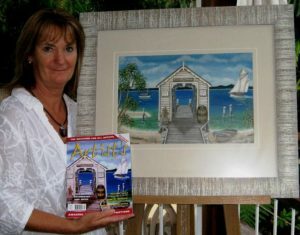 Her painting “Brammo Bay Boathouse” was featured on the front cover of Artists Palette magazine (which circulates worldwide) in April 2010 when she was also Artist of the month. 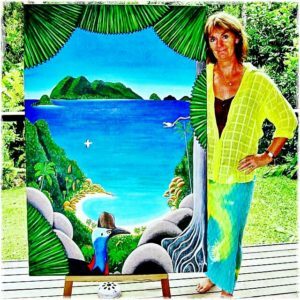 In Artist’s Palette a few months later she was also featured in an 8 page “Insight” article & painting demonstration entitled “Island Lady”. 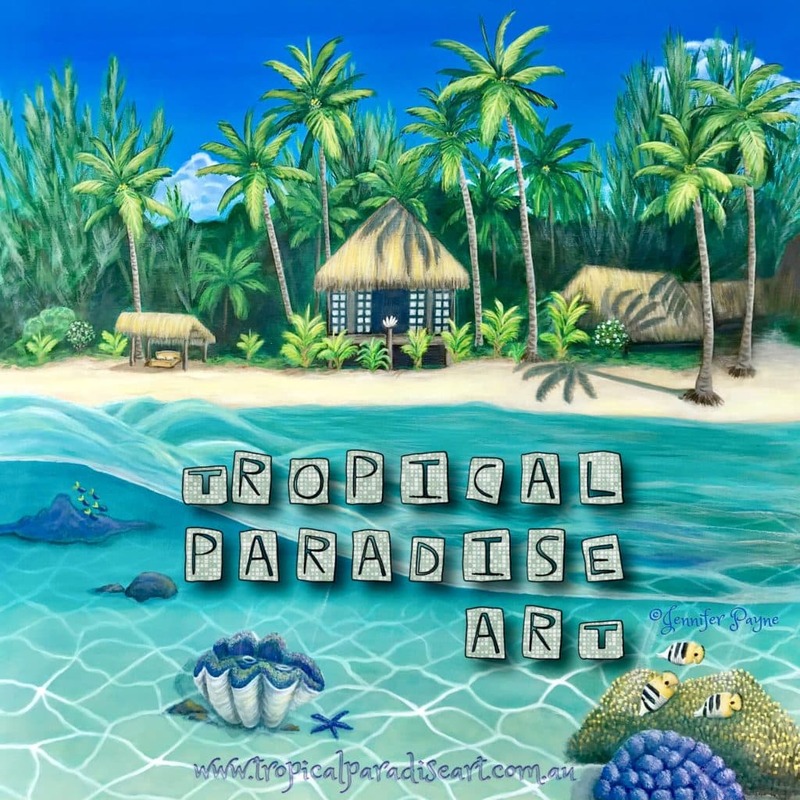 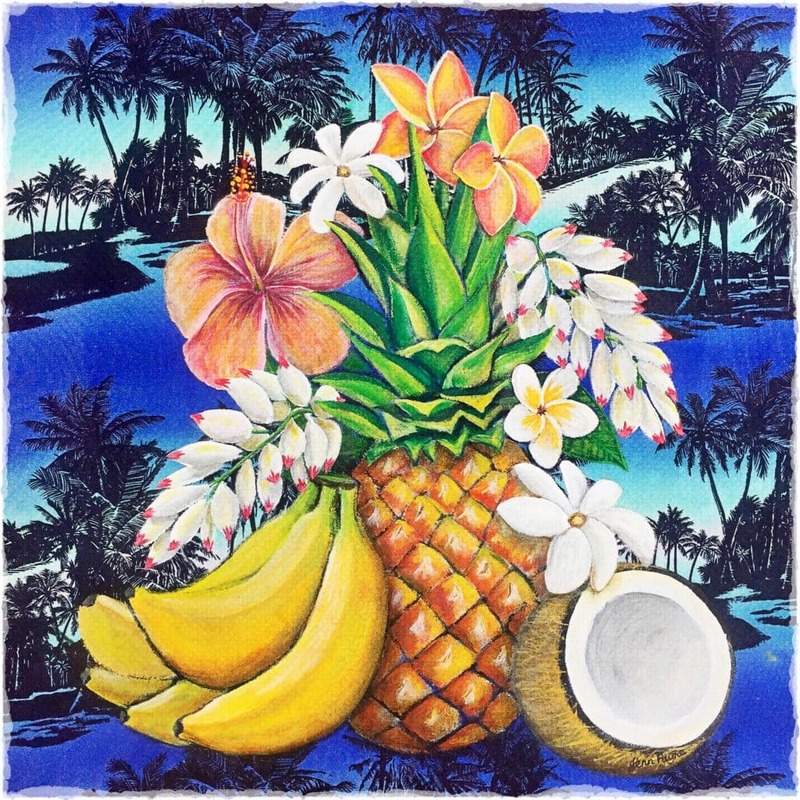 Most recently in October 2018 Jenns painting “Tropical Wonderland “ features as the front cover wrap for the book “The Magic of Mission Beach, Queensland, Australia. 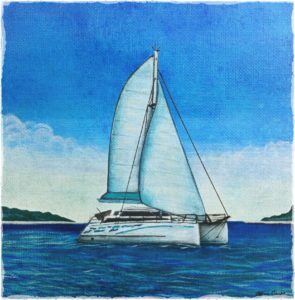 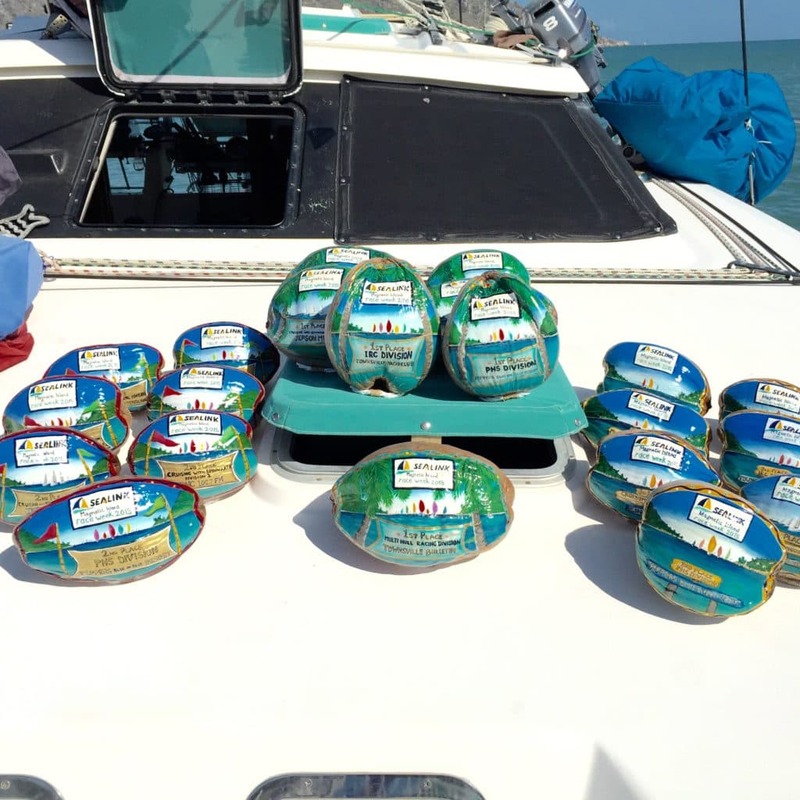 Jenn, along with her husband John lived aboard their sailing catamaran NYEKI for 5 years from 2011 – 2016 cruising the coast of Queensland. 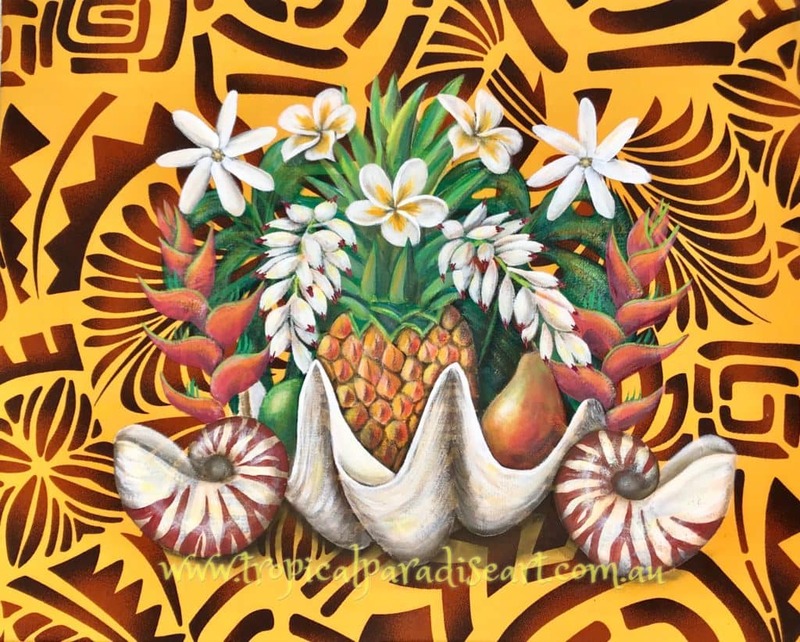 During those years she packed up her easel & concentrated on painting coconuts onboard as they were small, selling them at markets along the Queensland coast. These “coconut painting” days made Jenn quite famous with being dubbed as “coconutjenn”. 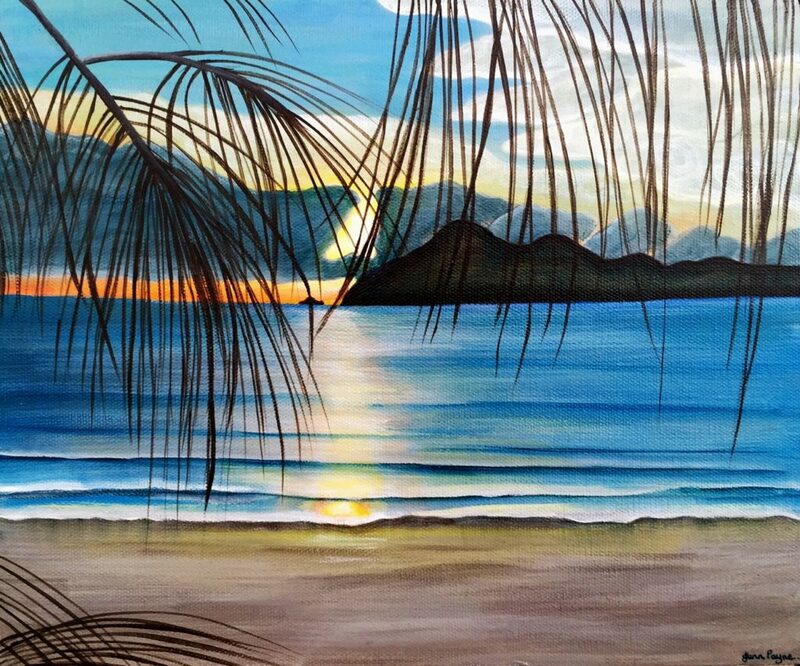 A keen photographer, (@coconutjenn on instagram) she is always capturing images to file that become paintings. Jenn has been a huge fan of Jimmy Buffett (the legendary American singer/songwriter) since she started working on the Tourist boats at Dunk Island in 1985. 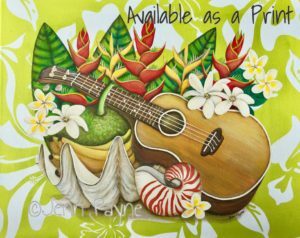 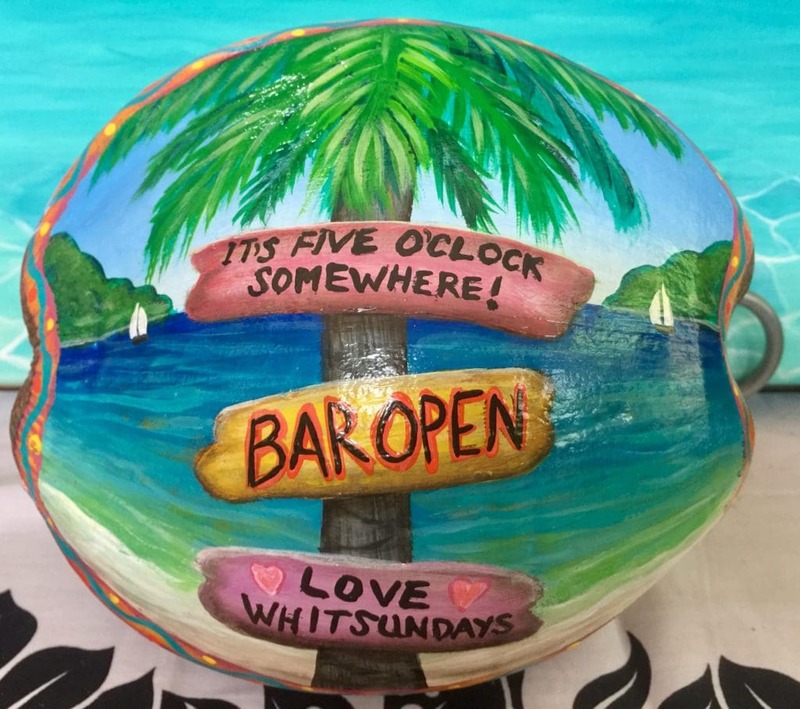 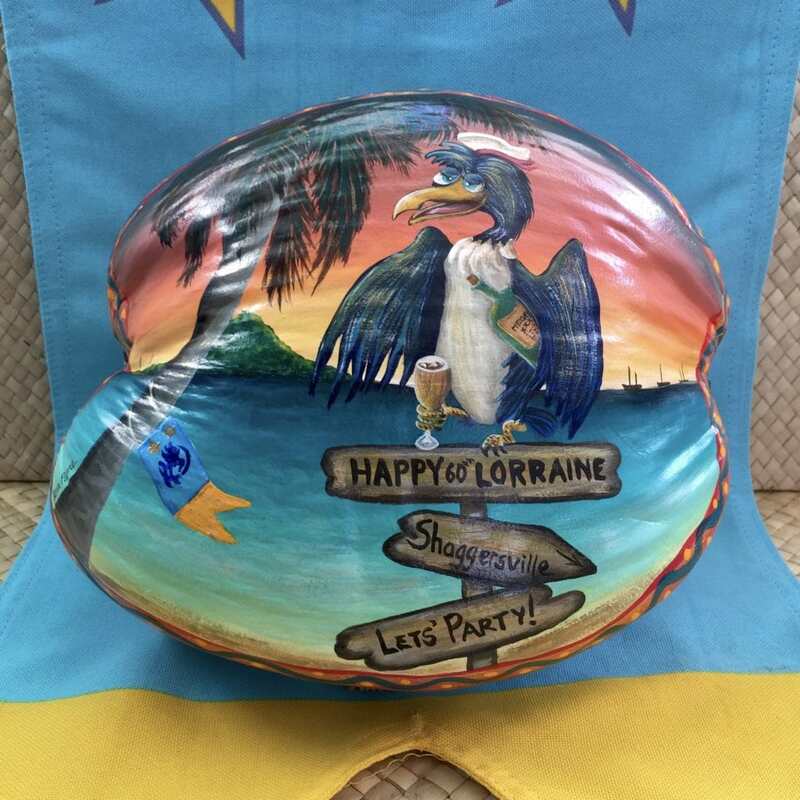 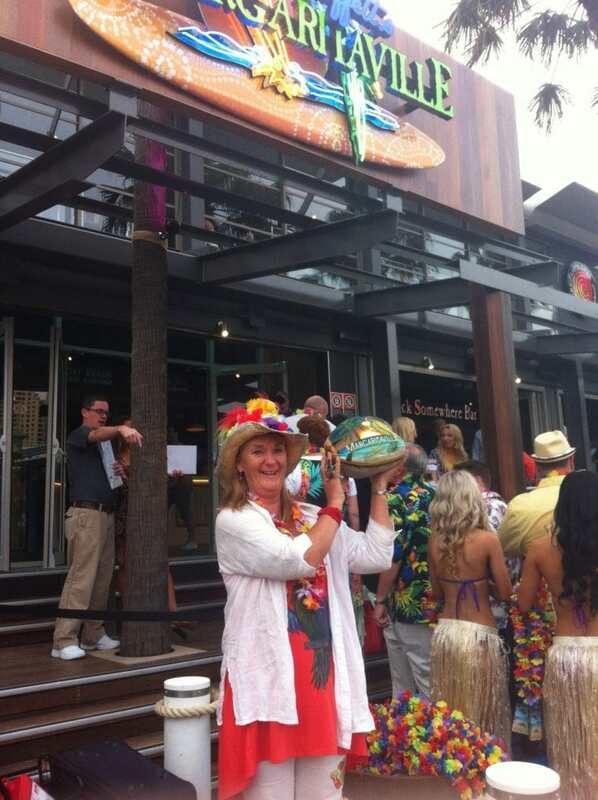 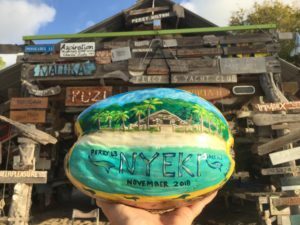 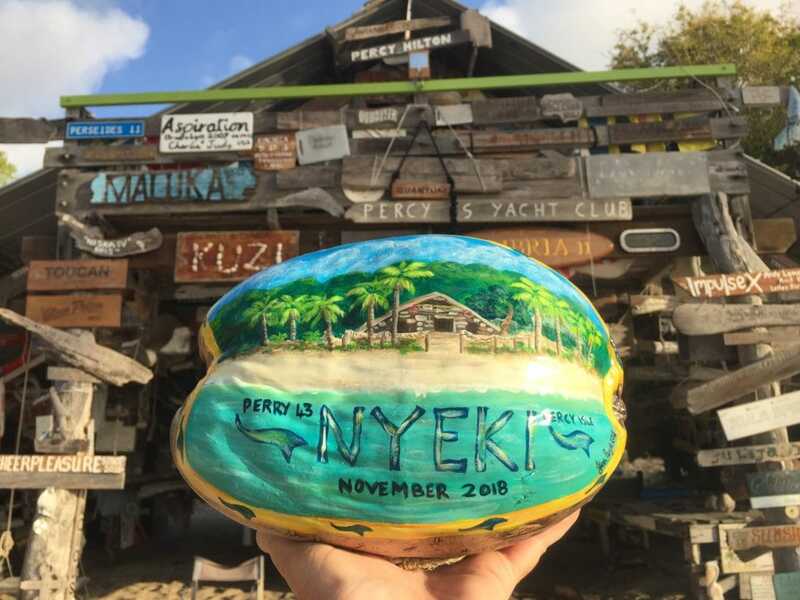 A special moment in her life was when Jimmy Buffett appeared on stage at the beginning of his Brisbane concert in 2012 with the painted coconut she had gifted him, in his arms. 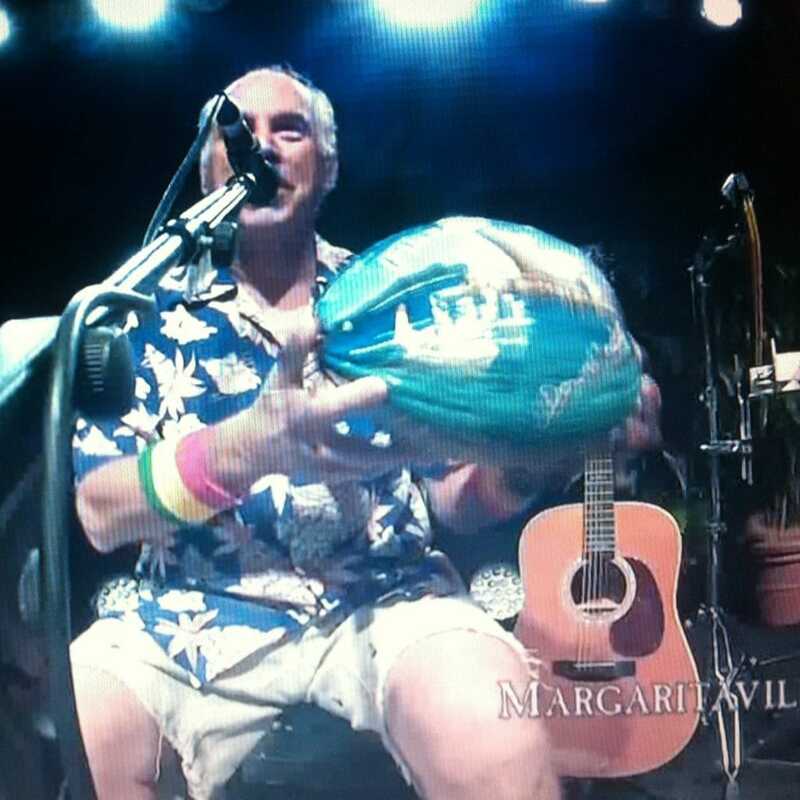 Thanking Jenn on stage Jimmy declared Jenn the No. 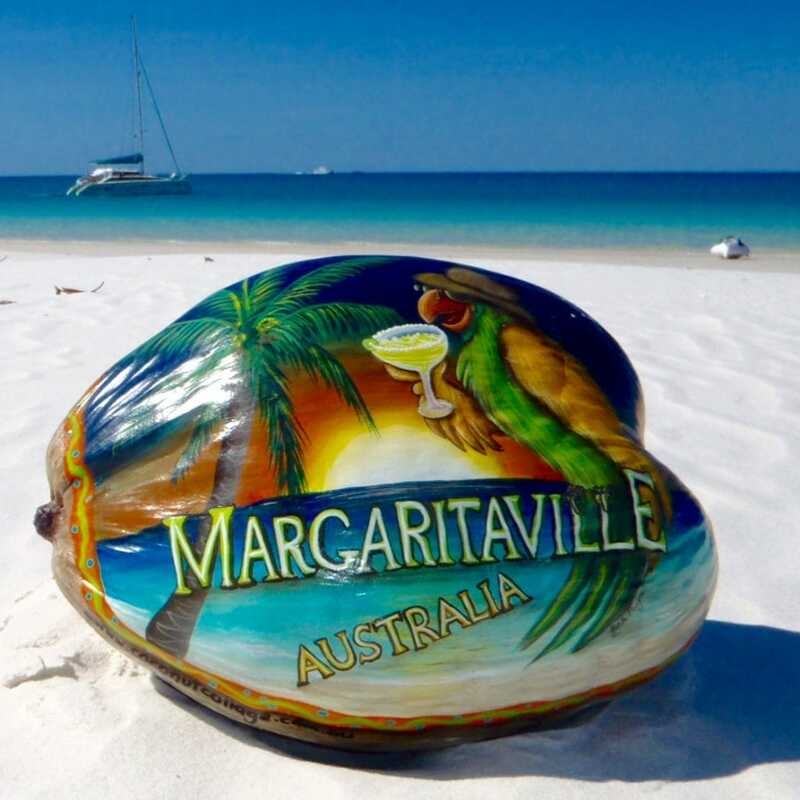 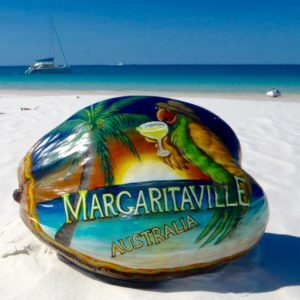 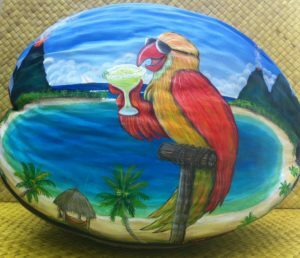 1 “Parrothead” in Australia and said his painted coconut was going “ straight to the pool room”, (see video below). 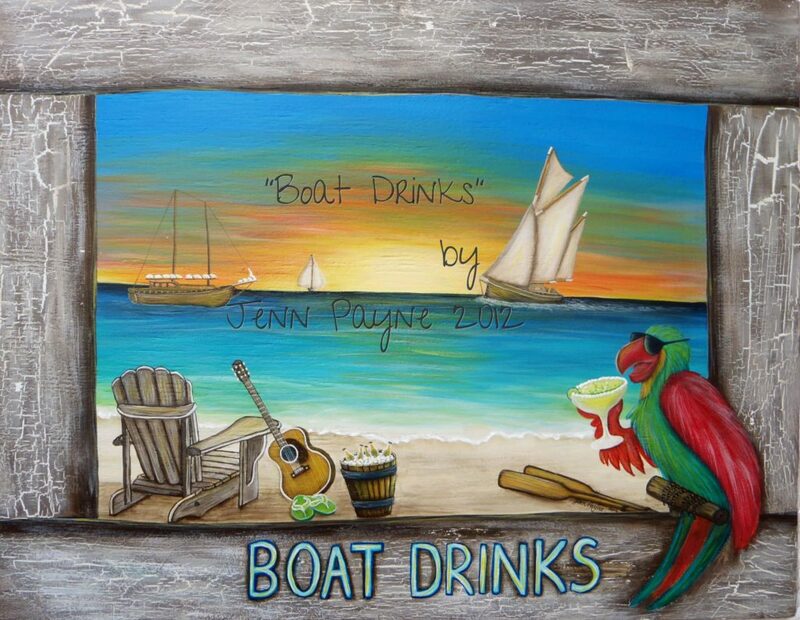 Jenn is still sailing the ocean part time but has unpacked her easel and now paints & creates mostly from her land home & studio the “Coconut Cottage” at Mission Beach. 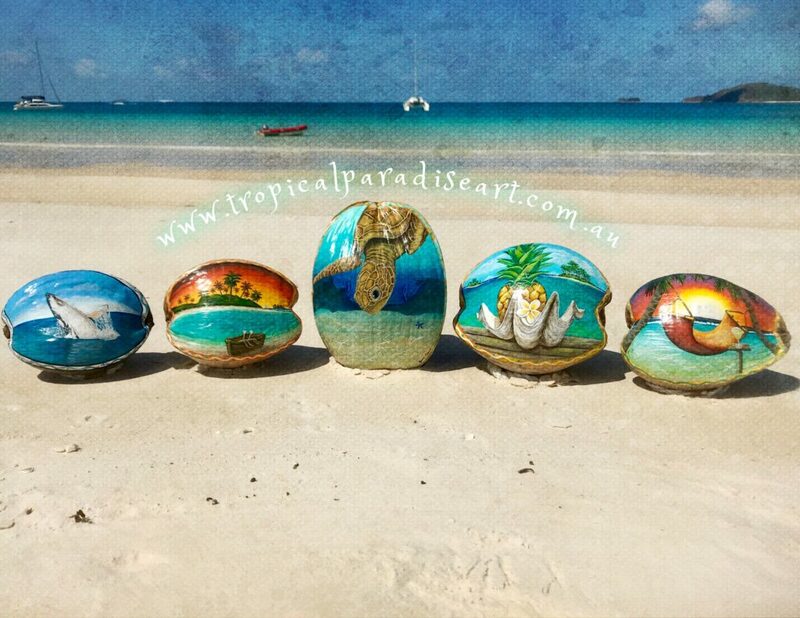 She also loves creating Homewares from her beachcombing treasures collected over the years from the Tropical Islands & Shores of Queensland. 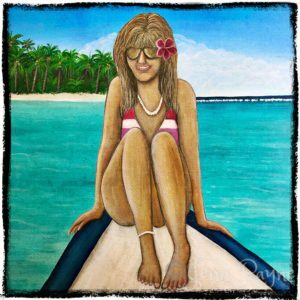 All Jenn’s Artworks and creations are painted and handcrafted by herself and will adorn your living spaces with a splash of colour & uniqueness. 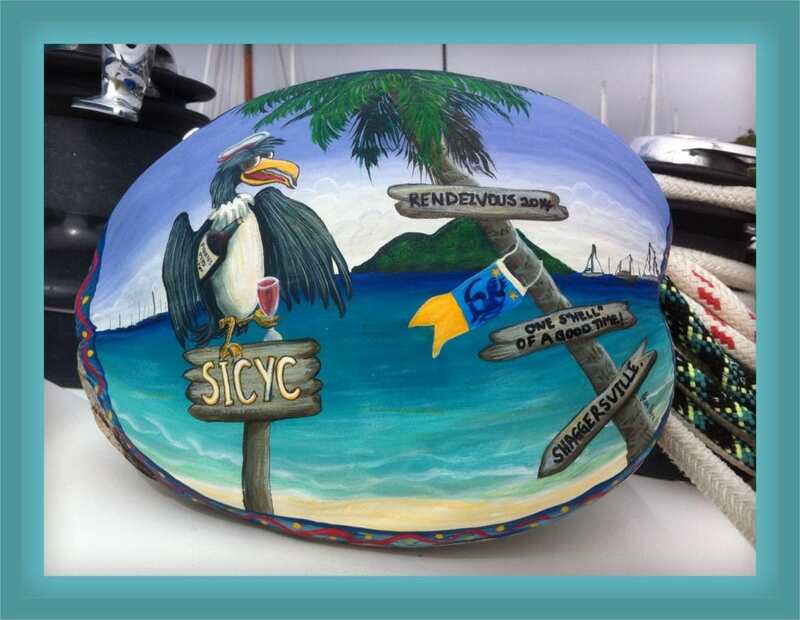 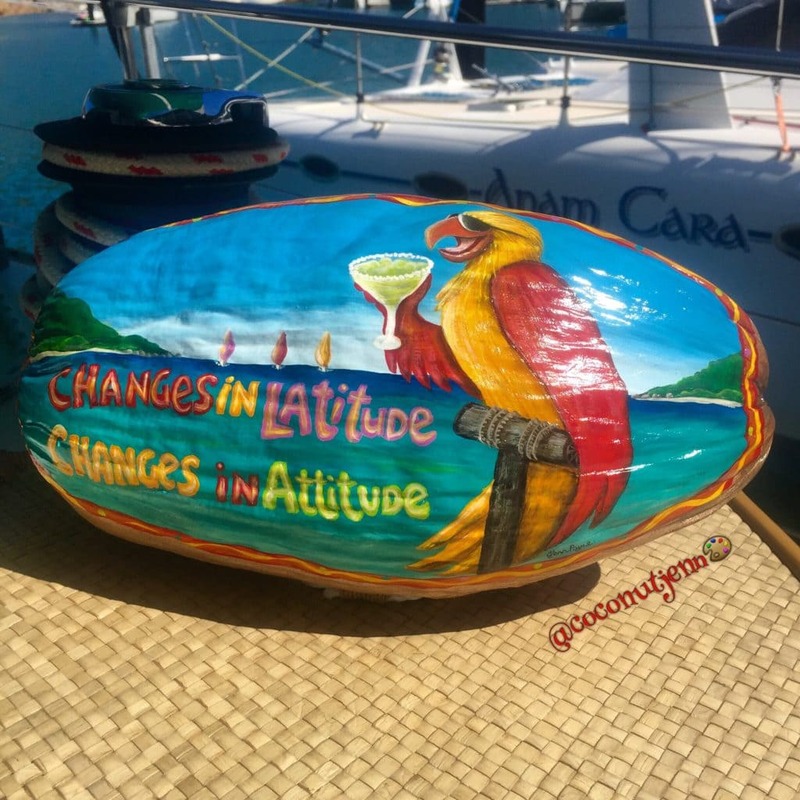 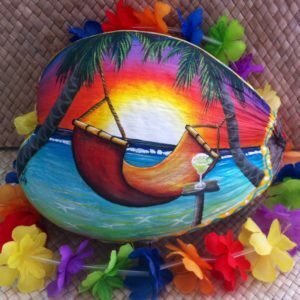 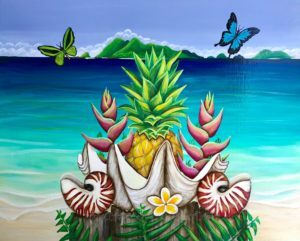 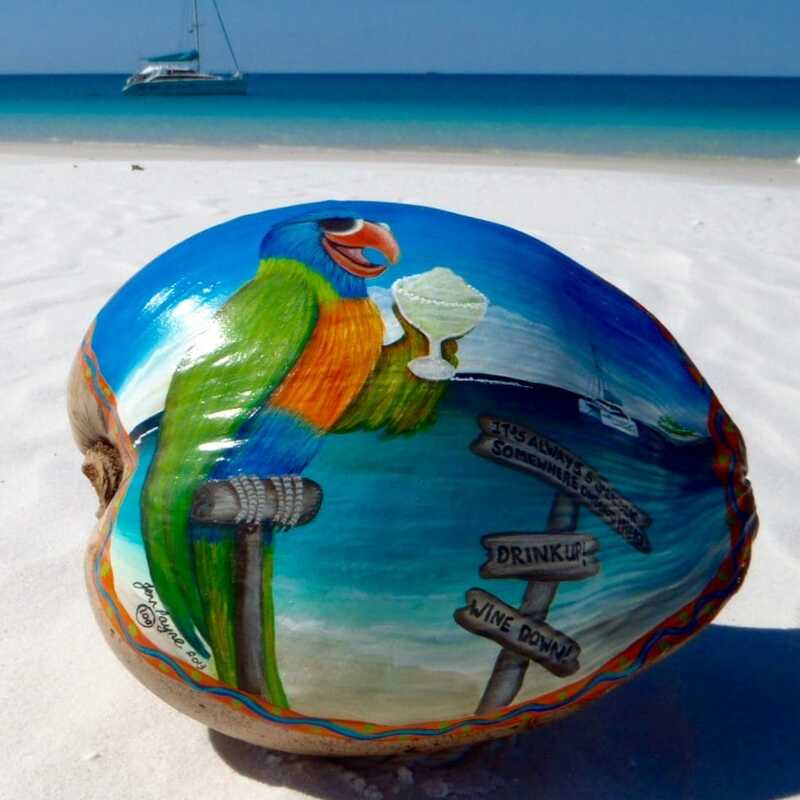 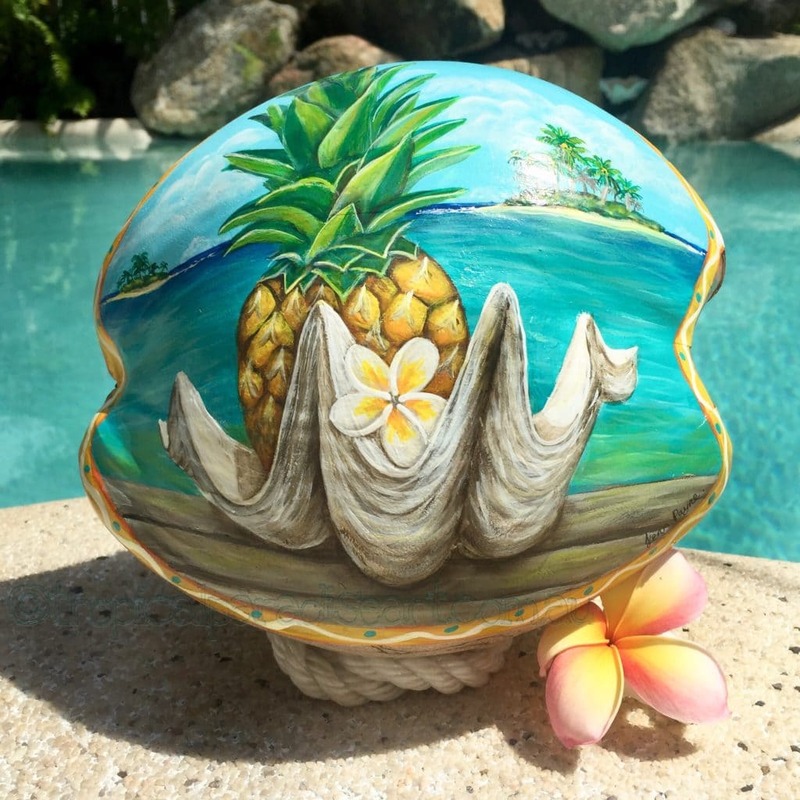 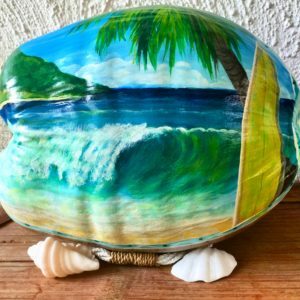 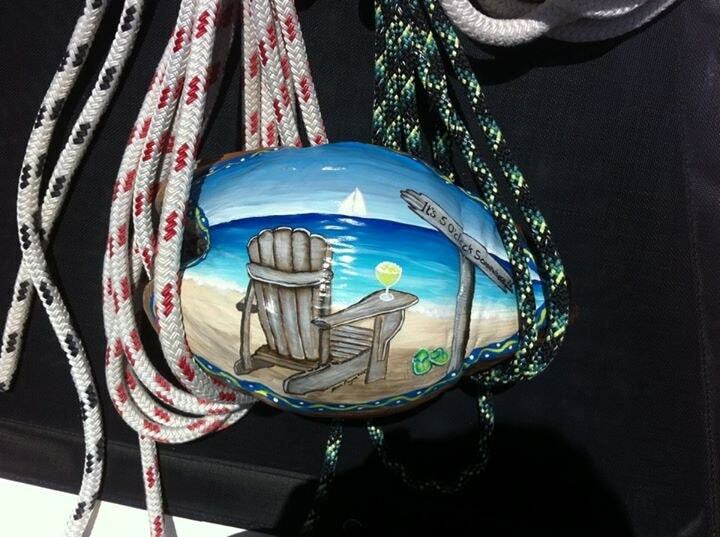 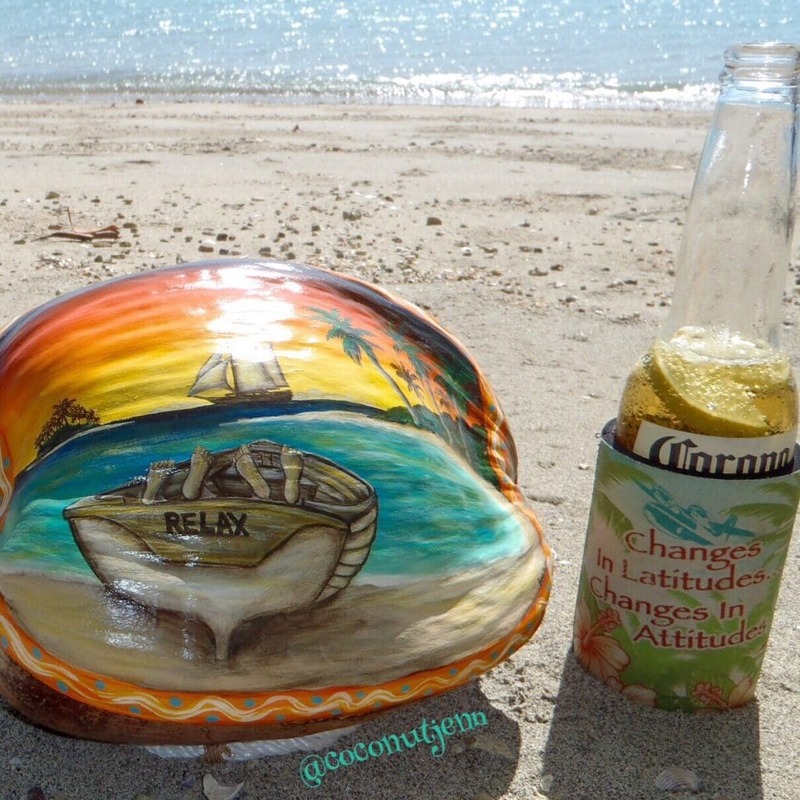 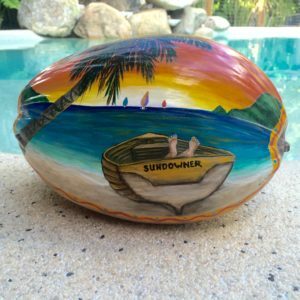 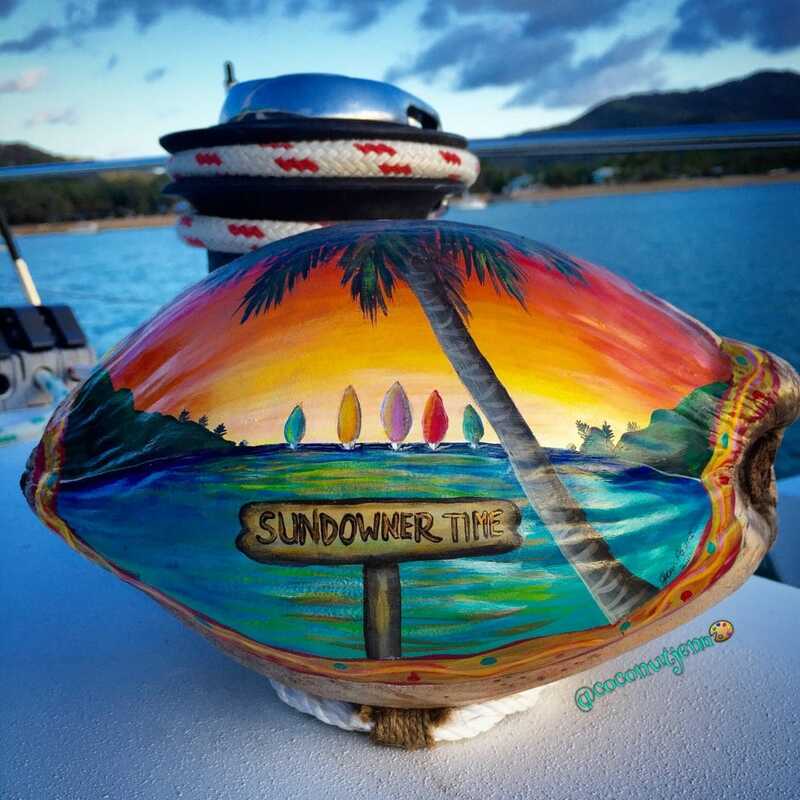 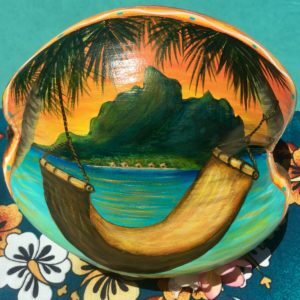 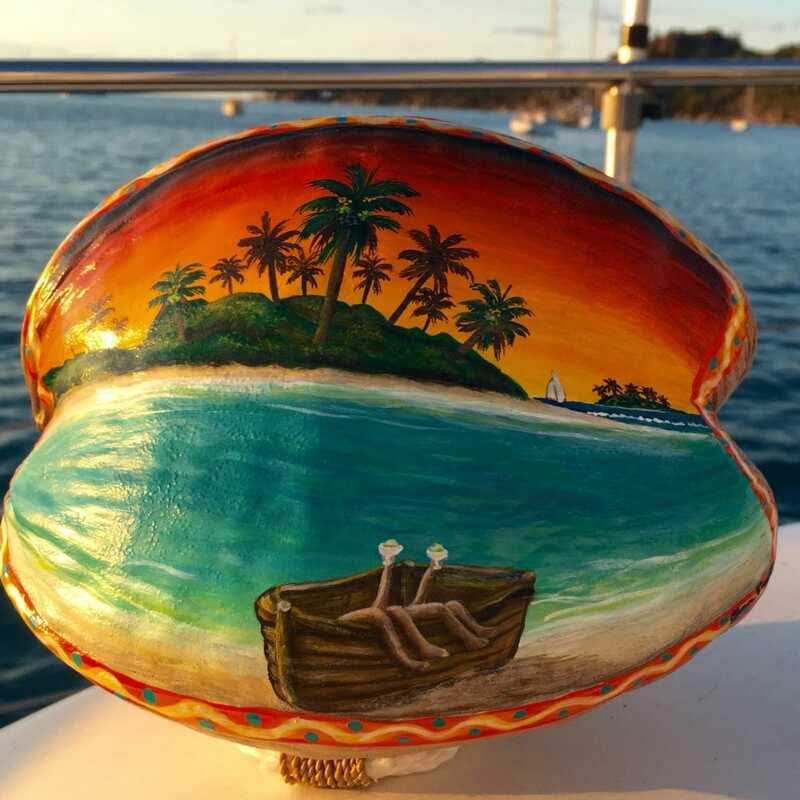 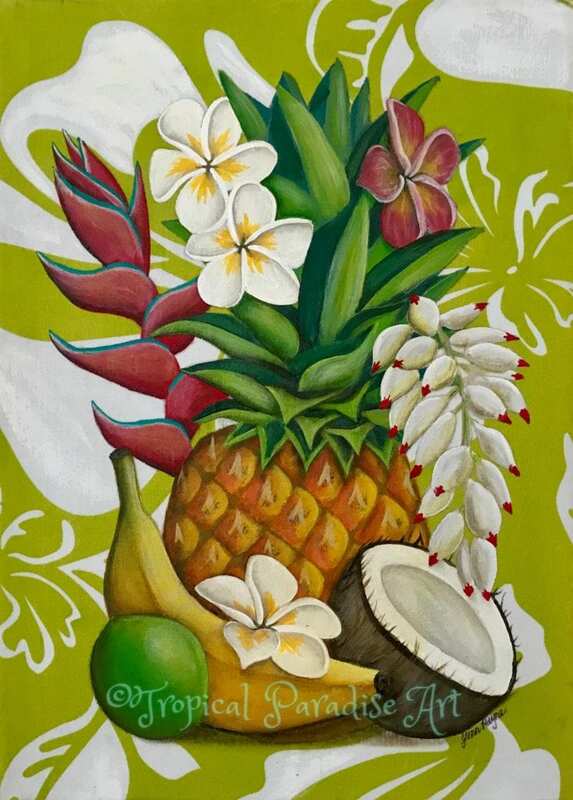 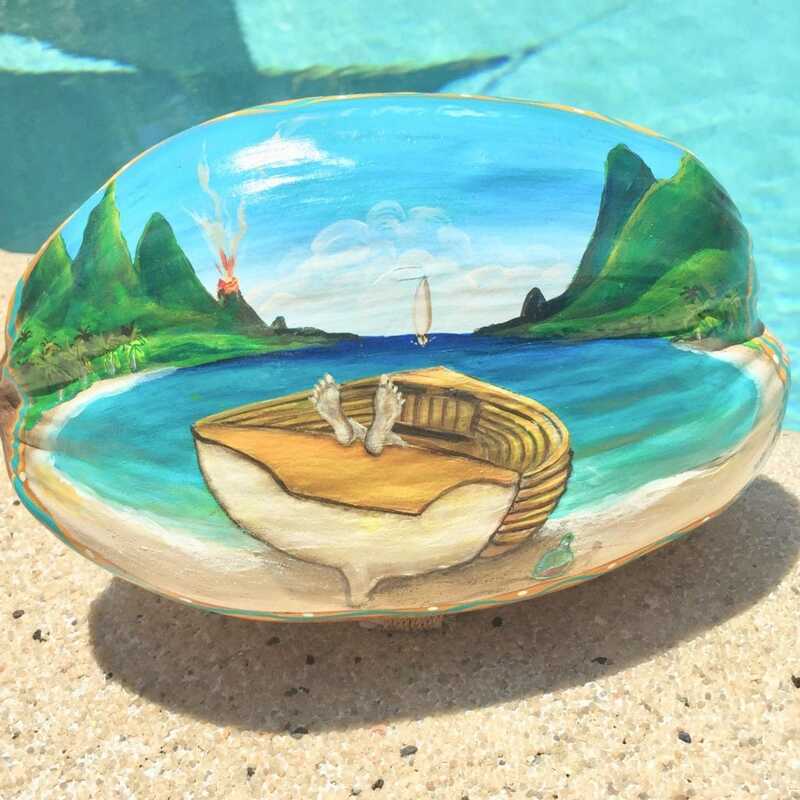 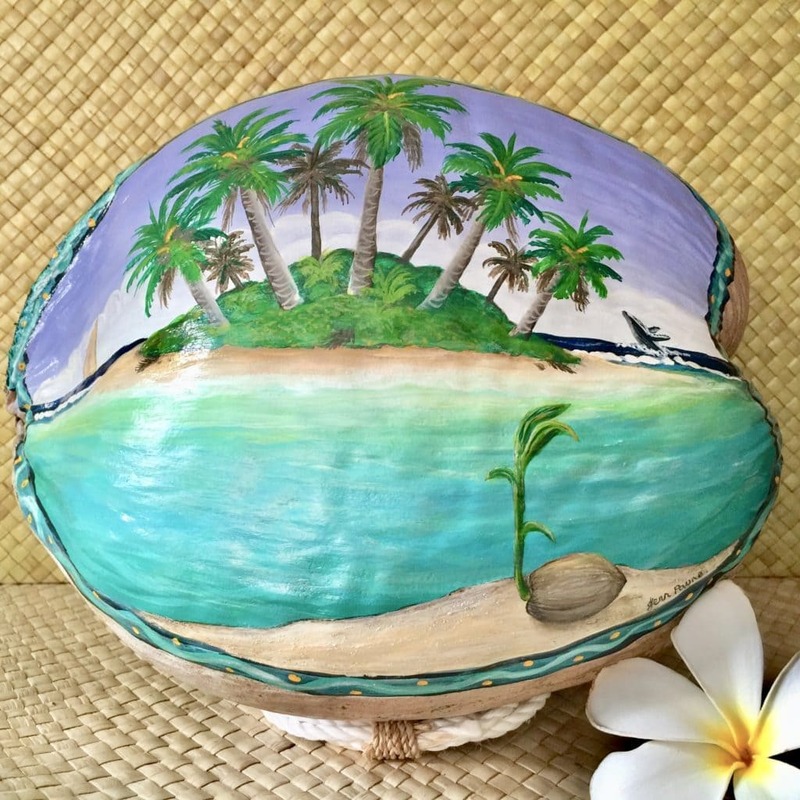 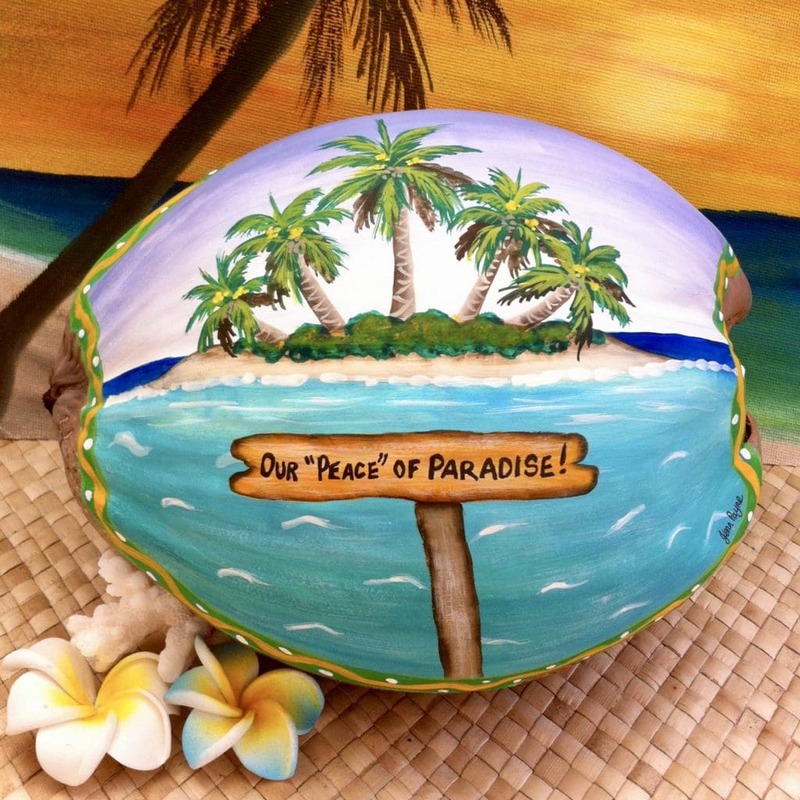 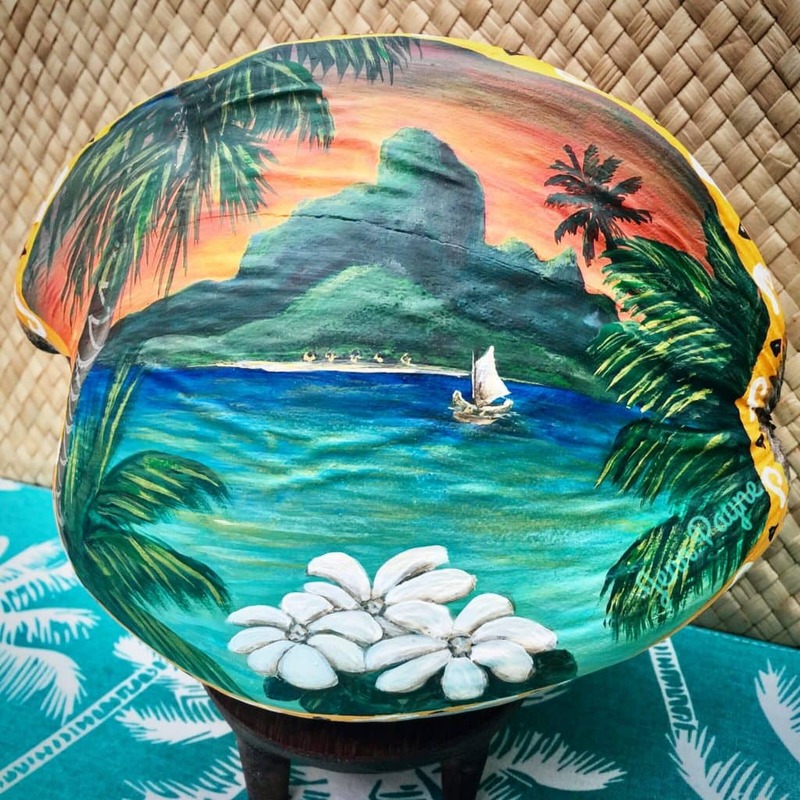 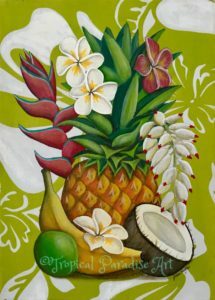 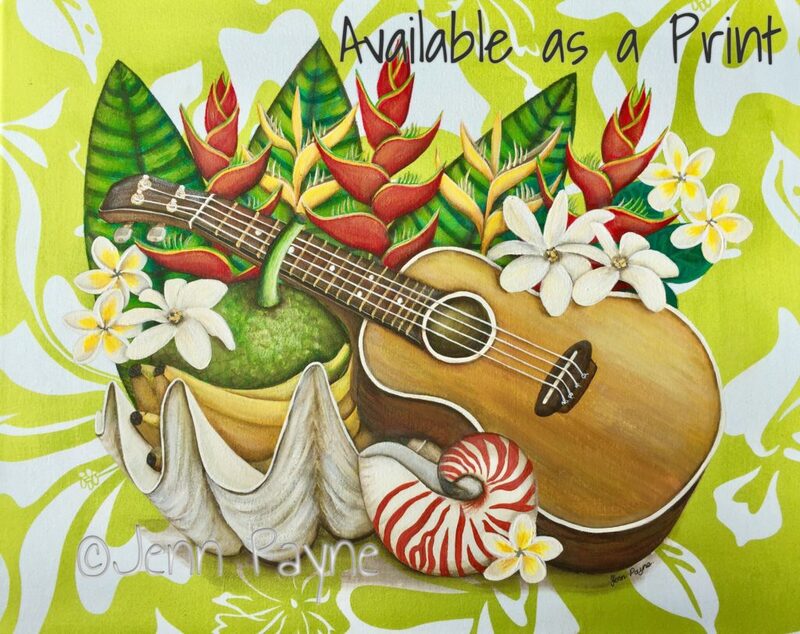 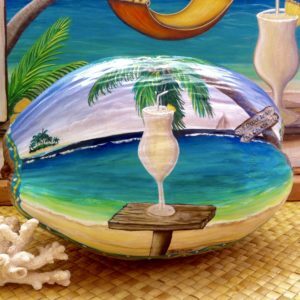 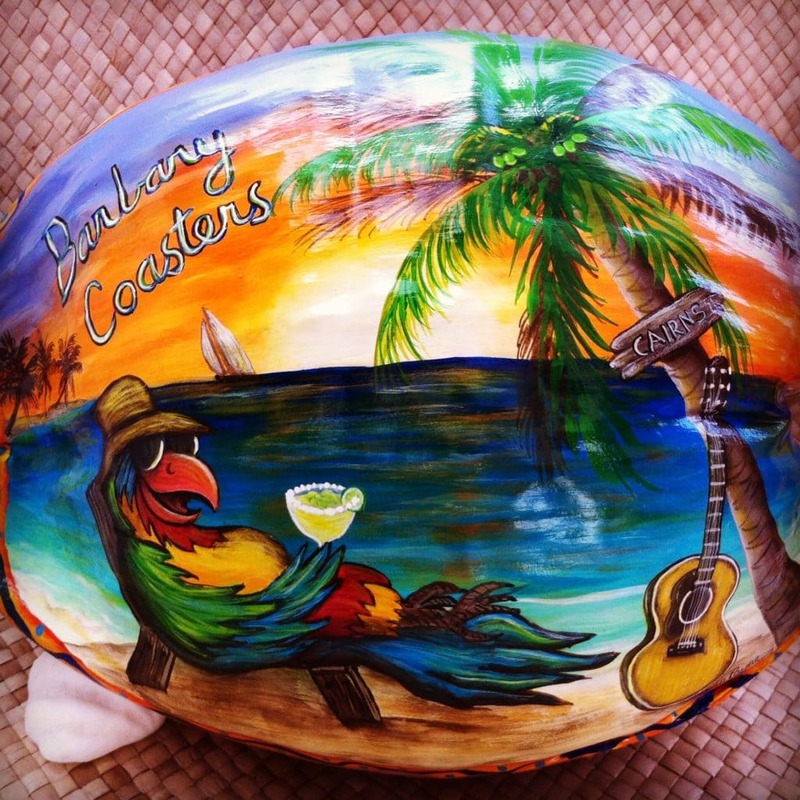 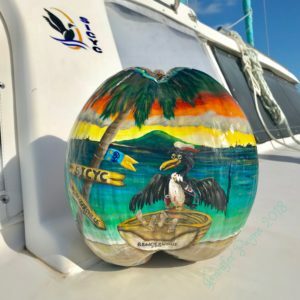 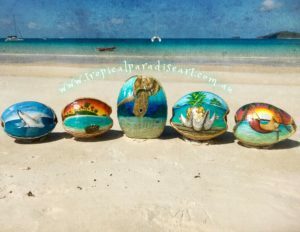 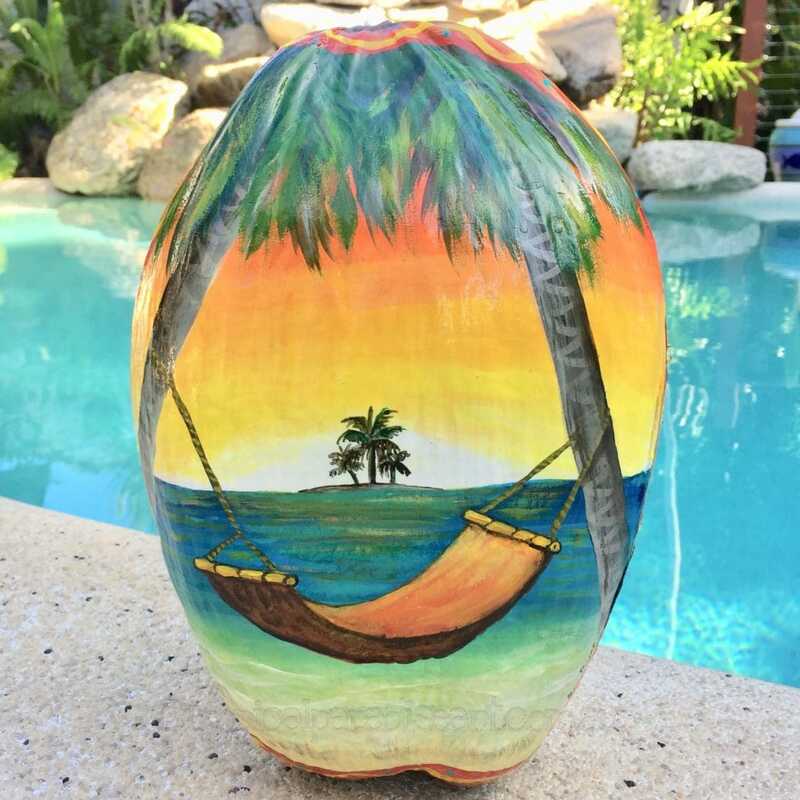 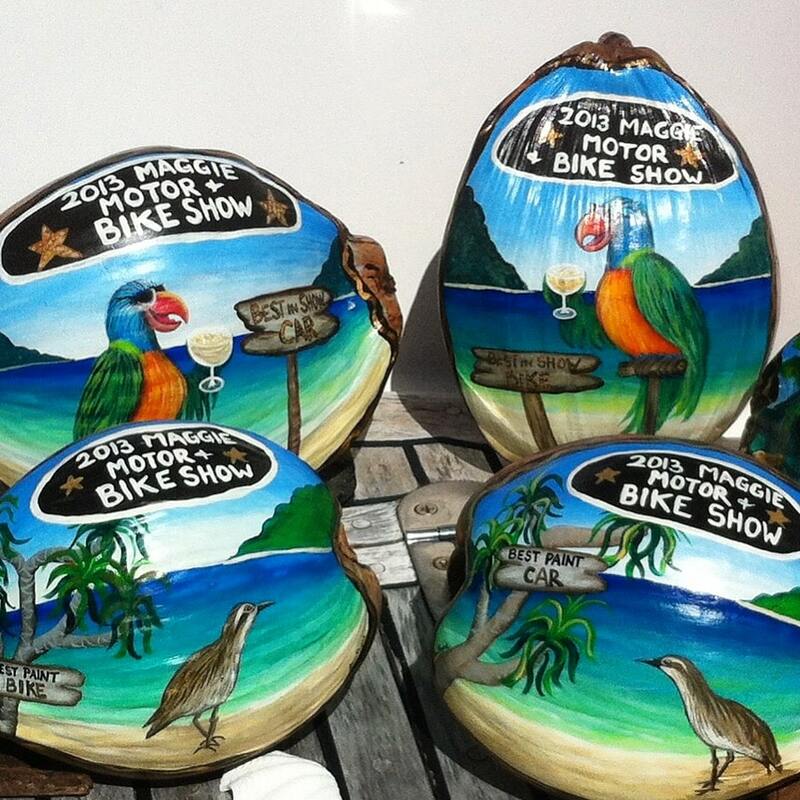 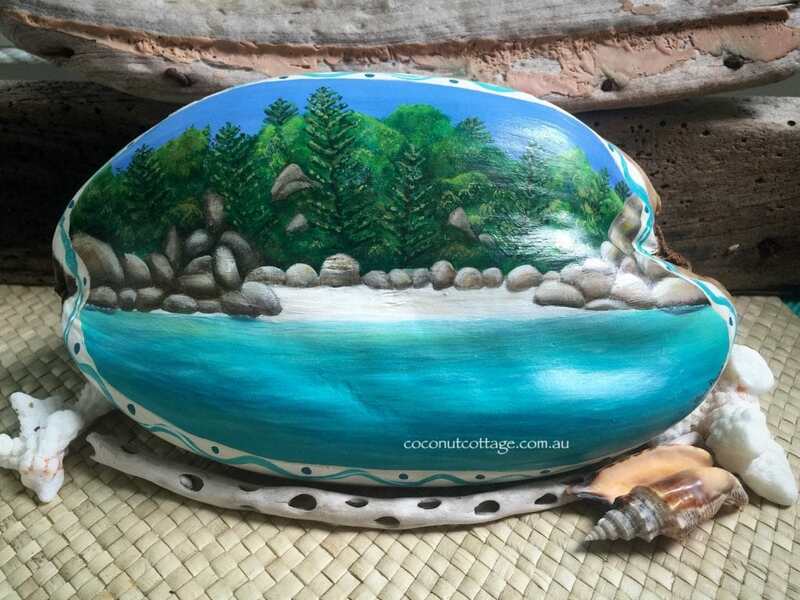 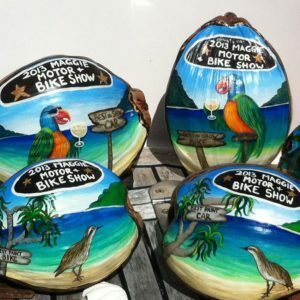 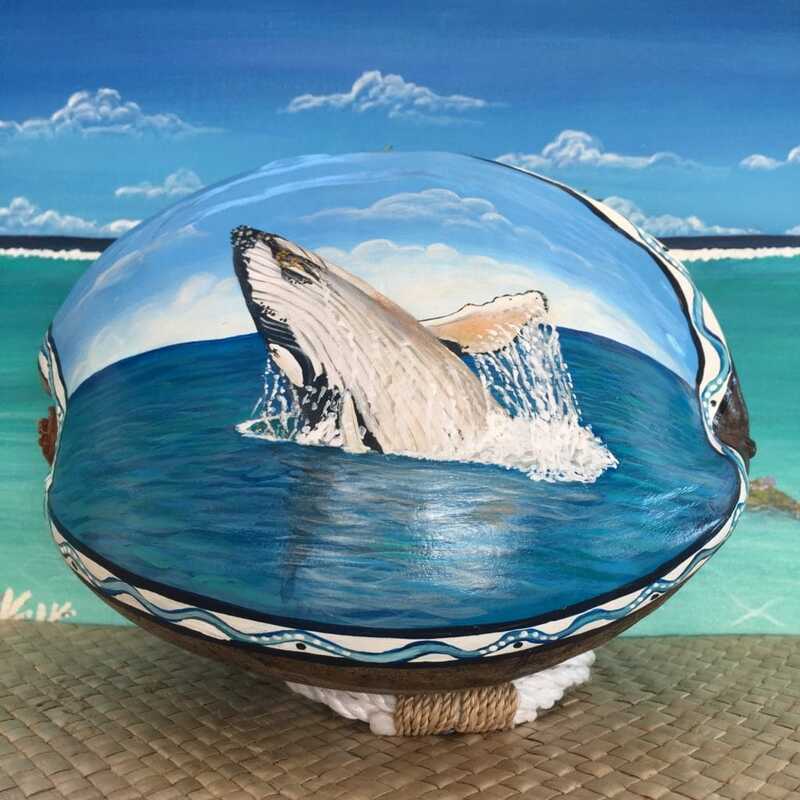 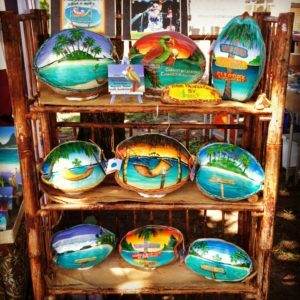 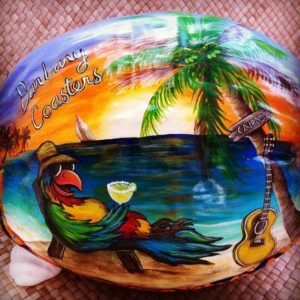 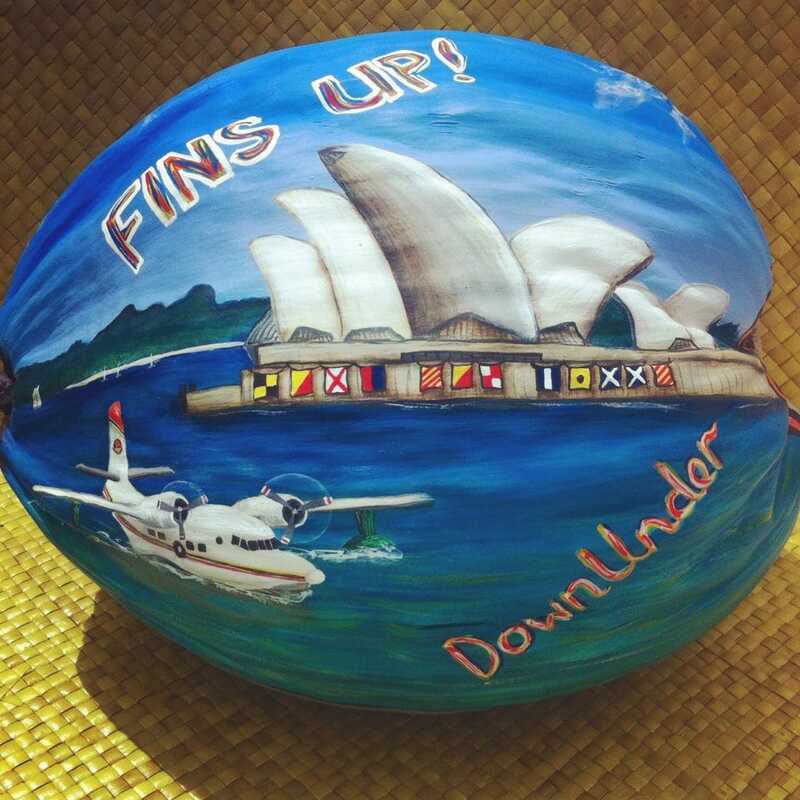 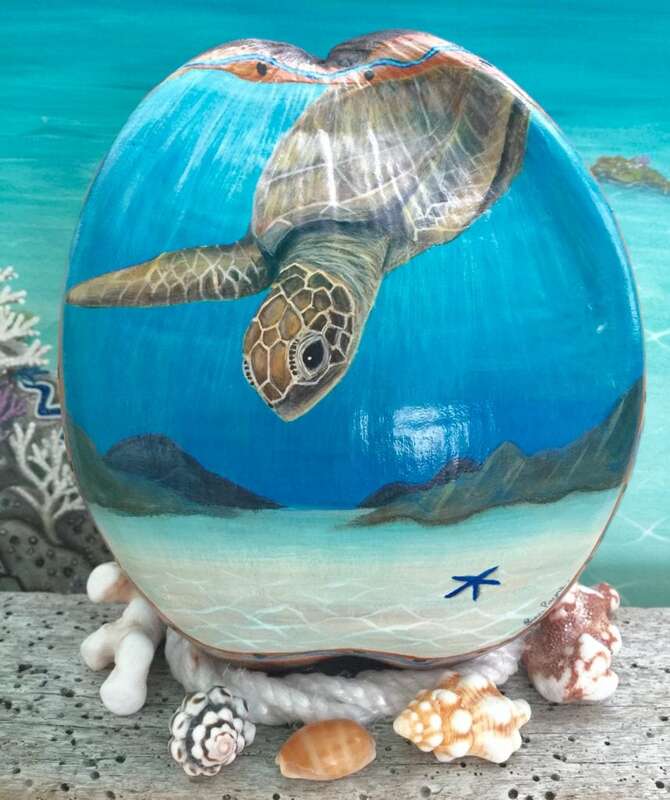 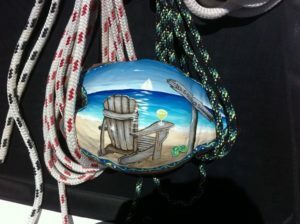 See below a gallery of Jenn’s Artworks & her Painted Coconuts. 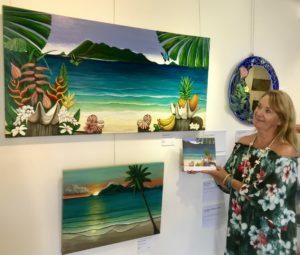 Jenn with “Tropical Wonderland” and the “Magic of Mission Beach” book.